/ Comments Off on Is the Gold Coast creative enough for the Commonwealth Games? 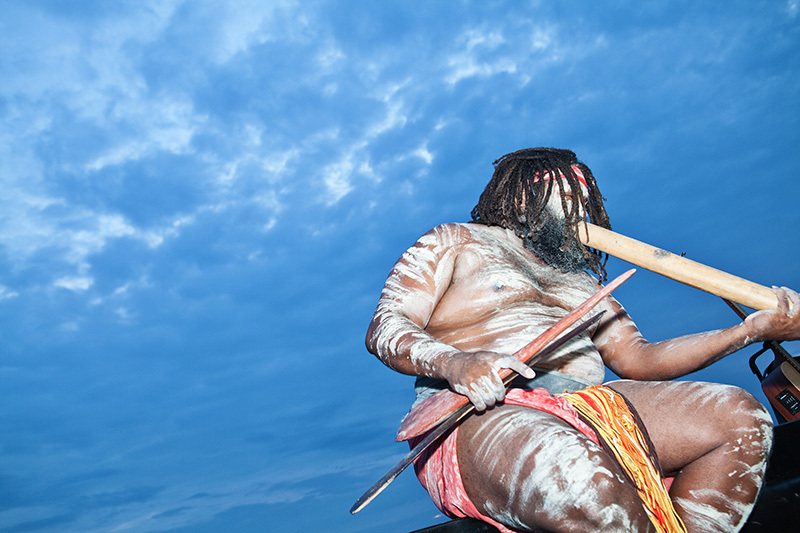 Is the Gold Coast creative enough for the Commonwealth Games? Marketing, design, branding and advertising agencies in the Gold Coast/Brisbane region have their work cut-out for them preparing local businesses for the Commonwealth Games 2018. As the smart brands scramble to update their marketing collateral, refresh their brand and capitalise on the benefits of an anticipated 650,000 visitors to the Gold Coast for the Games, the sad truth is that many local businesses will lament this time as an event that failed to meet their expectations. To understand why, we need only to look around at local brands and put them in context. Having worked in my previous profession as a Graphic Designer in Melbourne and London, then shooting in various other countries for 14 years, I returned to Australia with a subjective eye for Australia’s brand scene and frankly, I was shocked. What I was exposed to in London in 2000 was a far more progressive branding, design, marketing and advertising scene than my previously admired Aussie scene. By late 2014, very little back here had changed. Prolific copy-cat naming such as ‘All-Tools’, ‘All-Pools’, ‘All-Tyres’, ‘All-(insert industry type here)’ was everywhere, Incorrect Title-Casing of Copy Lines, client-led creative, horrific logos and amateur photography still lines the high streets. Clearly the value and purpose of creative industries has been missed by many business owners – and agency’s attempts to educate their clients have failed. Damn the torpedoes, someone has to say it; outside of the major metropolitan cities (and often in those too), Australia can tend to look like a quagmire of branding catastrophes! Within Australia, businesses can get away with this due to it being such a commonplace oversight. Foreign visitors, however, will have been exposed to quality branding, marketing and advertising. Any Australian businesses represented by poor identity, collateral and strategy will look like a joke to these people. Australian business owners need to have a qualified person – be it an honest friend or contractor, to audit their brand and give careful consideration to this. 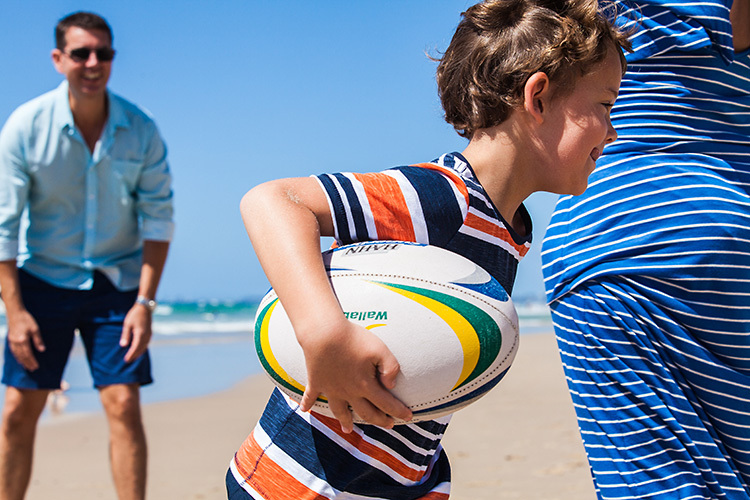 Opportunity exists to capitalise on a huge sporting event here in the Gold Coast and Brisbane region. My advice, for whatever it’s worth, is to do precisely this by remembering that, yes, ‘a brand is more than a logo’ – it is often the entirety of what’s used by your prospective market to judge your business – and if they want to engage with it. The misguidedness of clients choosing stock photography over their own custom content shot by a photographer should have gone without saying, but the tide has FINALLY turned back to Australian clients preferring custom imagery. Stock photography libraries have put countless photographers out of business with a plethora of cliche images for clients to choose from for cheap. But since they’ve controlled a cornered market, the prices for the better (rights-managed) images have soared, often making a custom shoot a cheaper option for clients. For those photographers still left standing, this comes as a great relief in ensuring not only our business, but also creative imaging itself has been saved! 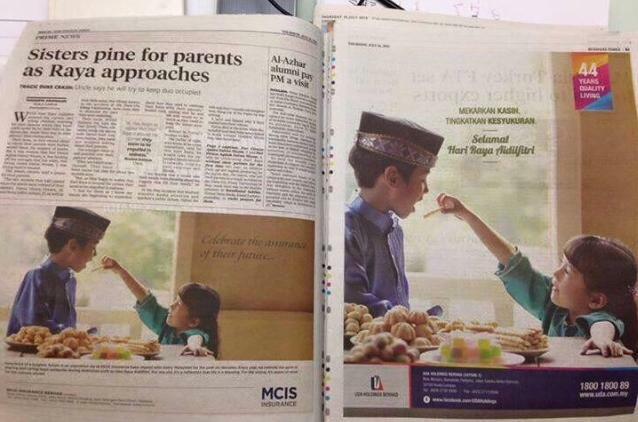 The below picture, showing the ads of insurance company MCIS and property group Urban Development Authority (UDA) appearing in the same paper’s edition was making it’s rounds on the internet a few years back. Yes, this has been a problem for years already – some brand managers learn slowly! A professional from a creative agency who spoke on the condition of anonymity said that duplications in the use of said images will almost certainly lead to confusion for consumers as they would be unable to tell brands apart. He also noted that this stock image nightmare highlights a lack of options in terms of quality images available. He explained, “The main reason why this is happening is that digital image libraries allow many different parties to purchase images at low prices. 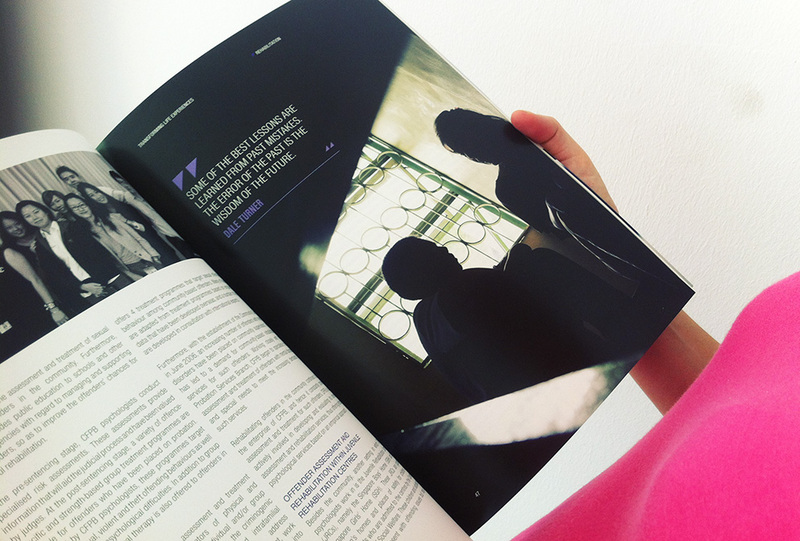 In this current age more often than not, communications have to go out at speed and at low prices due to difficult market conditions.” Since brands are not willing to spend on shoots, they instead turn to image libraries. “If brands wish to avoid the embarrassment of having their ads side-by-side with another brand utilising the exact same image, they will have to consider investing in shoots whereby they truly have ownership over the material. This will also lead to a higher degree of brand recall and better creative overall,” he added. In conclusion, the entire purpose of marketing and advertising is to give exposure to a brand through differentiation. To discuss creative solutions that will elevate your brand above your competitors, Australian brands must have access to photography content that their competitors and other brands don’t. Contact me here to ensure your next campaign is a winning one. 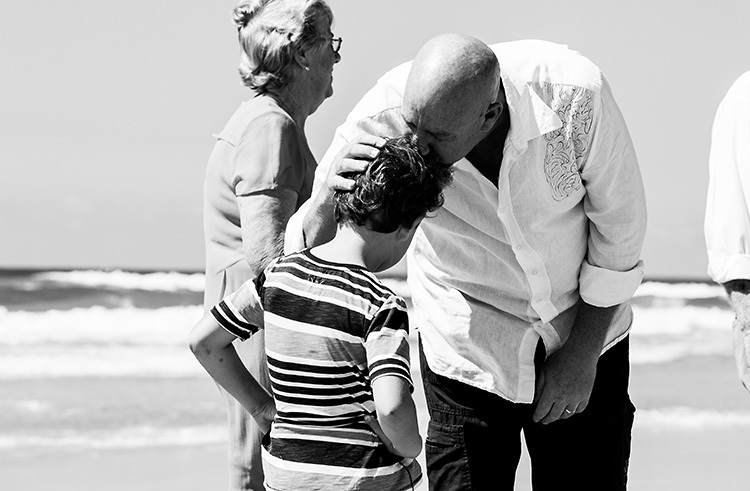 It’s been a very long time since I’ve done a family portrait shoot, so I had a great time with a cracking family a few weeks back shooting on a Gold Coast beach. Their little fella didn’t give my camera’s servo focus a break for a moment while he ran around with the kind of boundless energy that is a distant memory for most of us! 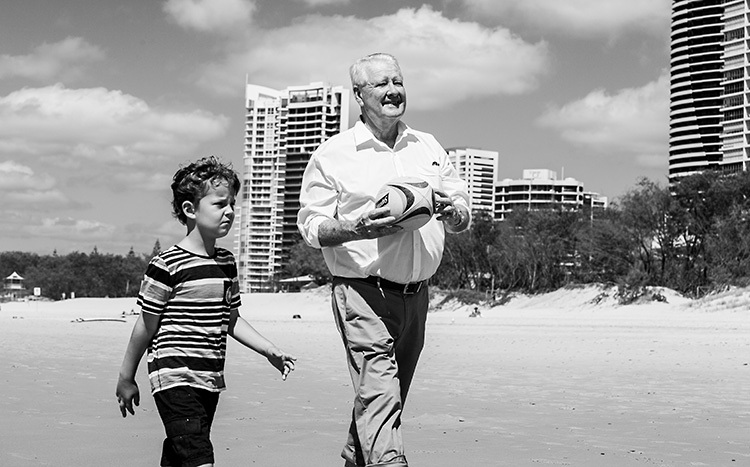 Three generations of family converging on the Gold Coast from all over Australia is a pretty special time, so it was great to meet a client who didn’t want cheesy family portraits, but to instead capture some nice memories for them in a very natural, informal family portrait style. If you’ve been thinking about finding a photographer to shoot your family (or even photograph them! ), do get in touch for a more contemporary portrait session. It’s always nice when a publisher gets back in touch to shoot another cover for their magazine. 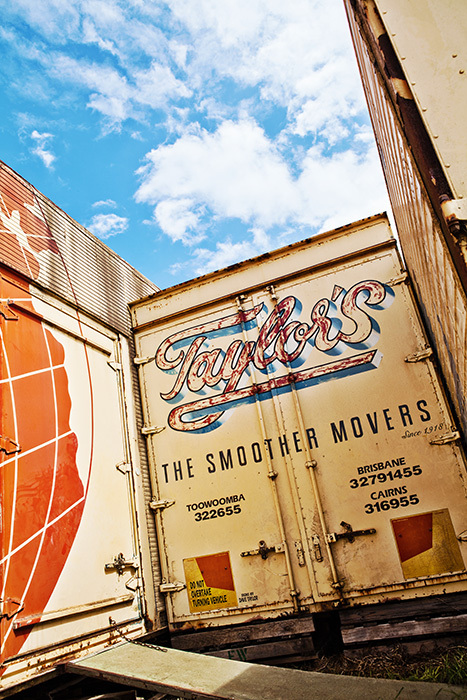 Australian transport and industrial magazine photo shoots require photographers to really look hard for image solutions. When photographing heavy transport businesses and their vehicles, there’s no glamour to be found – everyone’s wearing high-vis, many people are reluctant to be photographed and portraits often require a truck’s bug-spattered front grill to be the background! But I’ve learnt over the years that if you look hard enough, photographic beauty can be found anywhere – even for portraits in such locations. If you have a challenging business or subject that you need photographed for more attractive marketing collateral, please do get in touch. 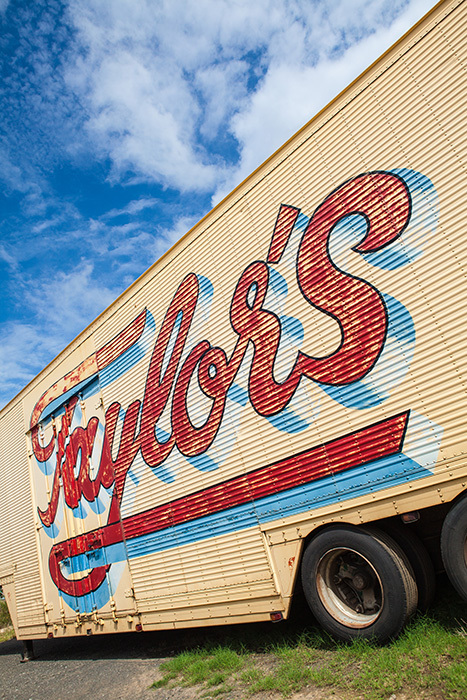 Heavy industry, medium-light industry, haulage, storage, marine, industrial, cold storage, farming – I shoot Australia-wide. A few weeks back I met with a Gold Coast business which had recently been through several product photographers while shooting products for their online store. They weren’t satisfied with the colour accuracy and a few other aspects of their existing content so needed a new photographer. Step one was ascertaining WHY the product colours weren’t accurate and was solved with my first question; ‘Did they shoot with a colour card’? The answer was ‘no’. 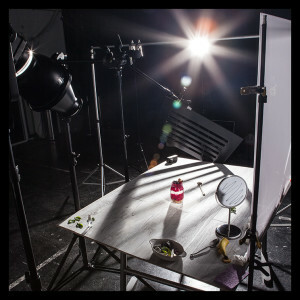 Whether photographing product, food, people, architecture – a reference shot with a colour card is needed to calibrate accurate image colour hues for the post-production part to come. Without it, you’re just ‘eye-balling it’ and relying on memory. 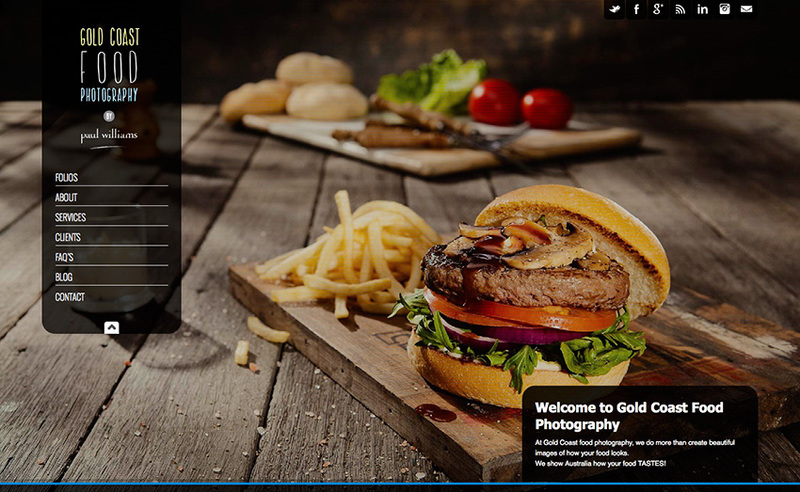 This client’s site is a great example of how to differentiate your brand by auditing your competitors. 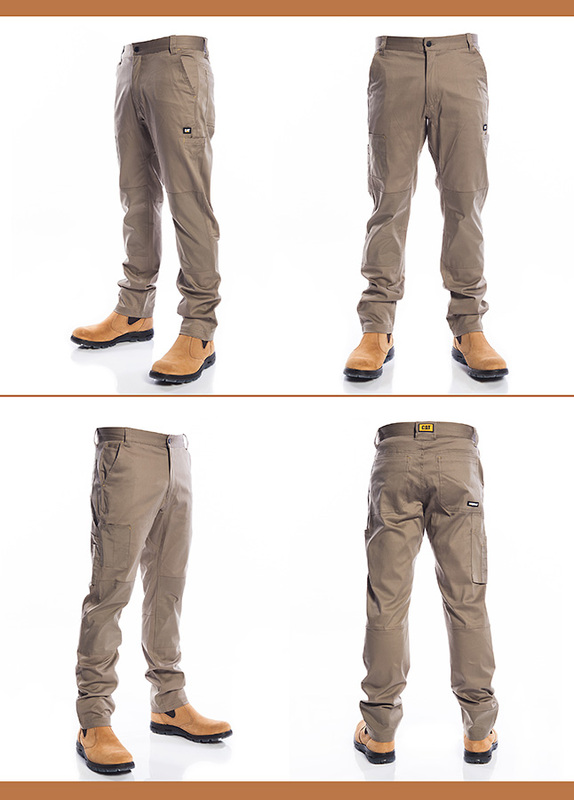 They noticed that none of their competitors used product photos that show all angles of the workwear clothing. Simply by investing a little more time and money into their product photography, they now have a USP for their customers – who know exactly what they’re getting. This gives the customer ‘buyer assurance’ and the sales figures have reflected the worth of this investment accordingly. Pretty simple stuff that’s overlooked by a surprising amount of online retailers that’s a surefire route to growing their online store sales. If you need help marketing your online business with strong product photography and you’re in the Gold Coast/Brisbane region, do feel free to contact me for a free consultation. 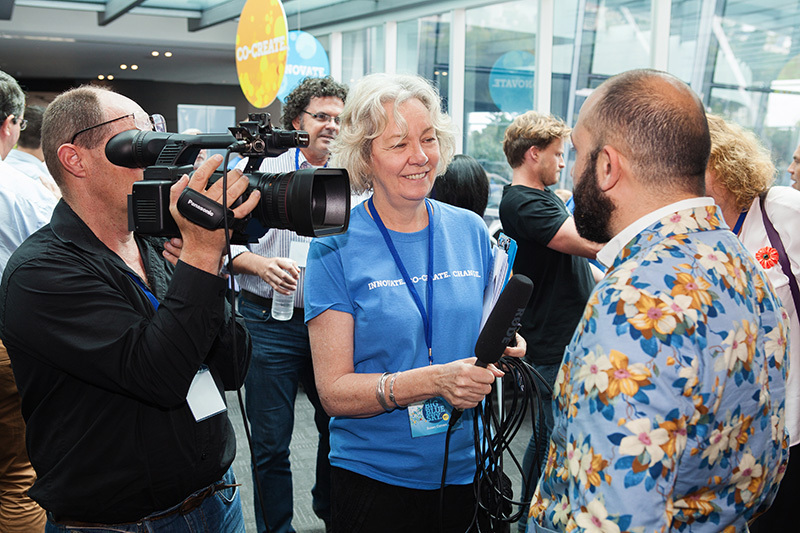 November 2015 saw some of the world’s most accomplished change-makers of the moment converge on the Gold Coast. 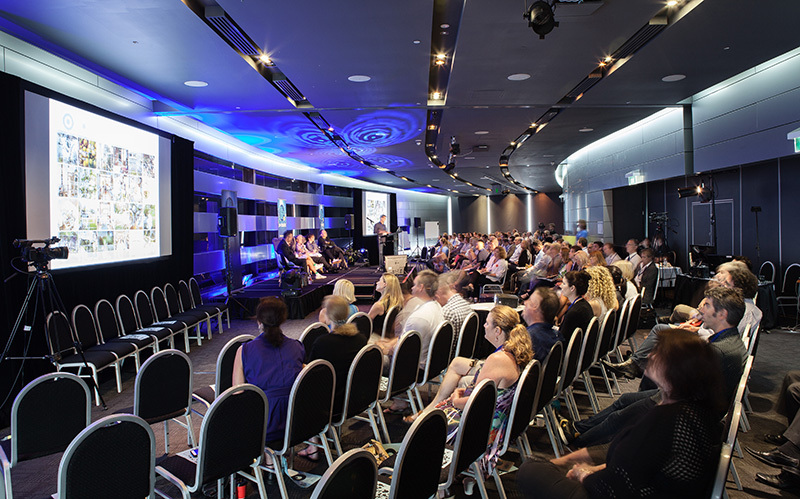 The inaugural Big Blue Sky event was the platform for Gold Coaster’s to hear a wide range of inspirational success stories presented by these excellent speakers. It was a great event to photograph, as I had the privilege of hearing them all while shooting! 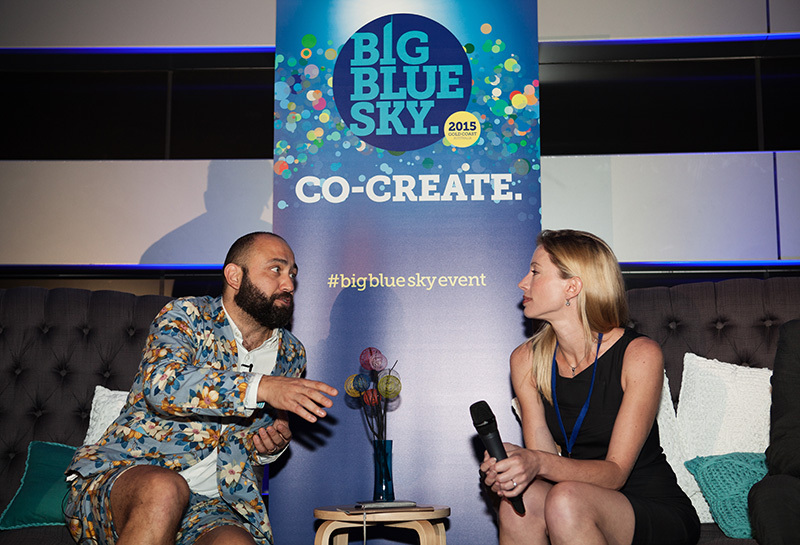 Largely focussing on digitally disrupted industries and positive growth stories, the founders of Big Blue Sky propose a rethink, repositioning and renewal of what the Gold Coast is best known for. Silicon Beach is one of the initiatives to have come from November’s two day head-scratching and chin-rub-a-thon and you can read more about it HERE. 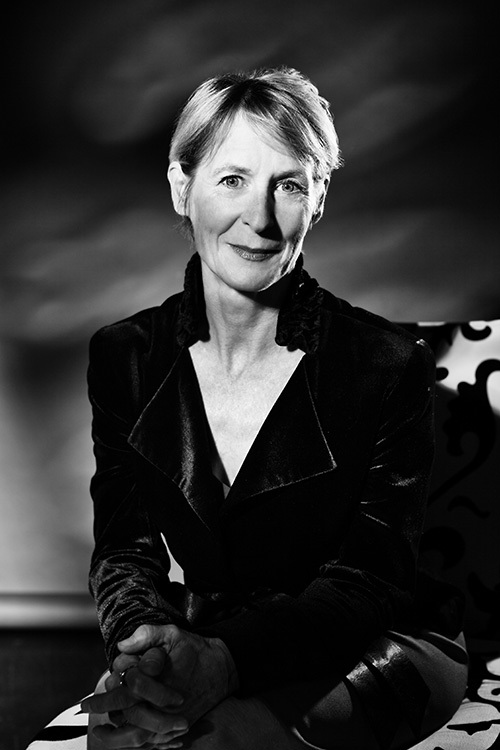 Recently I teamed-up with Susan Curran – a writer of exceptionally broad international experience with UNICEF, the ABC, BBC to the UN High Commission. Susan approached me to propose that we co-create what I’ll lazily term here as ‘high-brow content’ for Christine McDougall – one of Big Blue Sky’s founders. This Writer-Photographer collaboration is something that I always enjoy and Susan and I are now providing this two-prong offering to select Gold Coast and Brisbane clients as commissioned. Gold Coast & Brisbane foodies can check out my dedicated food photography site for my latest blog food shoot news, food trends, recipes and other time-sapping wonderment. The photography business has gotten off to a great start for 2016 – a good sign for business in the Gold Coast/Brisbane region. 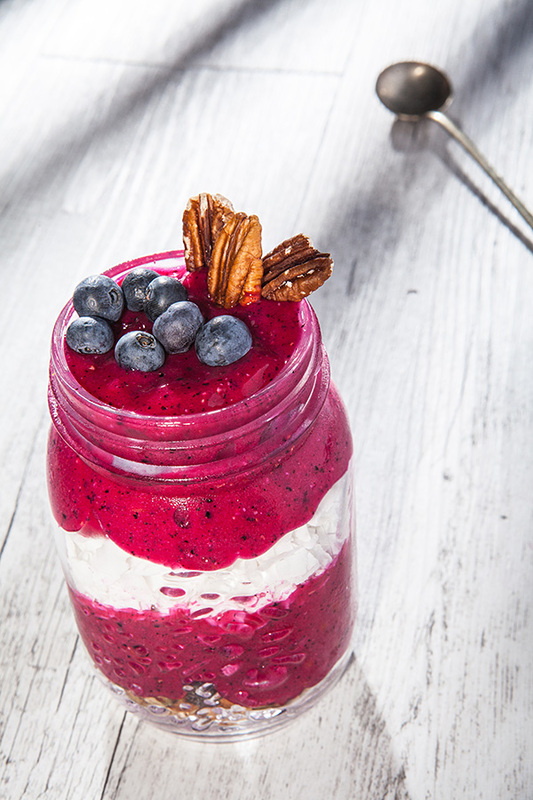 I’ve been shooting a lot of food lately, hence the silence on this blog! You can read about these shoots on my independent food photography site here. 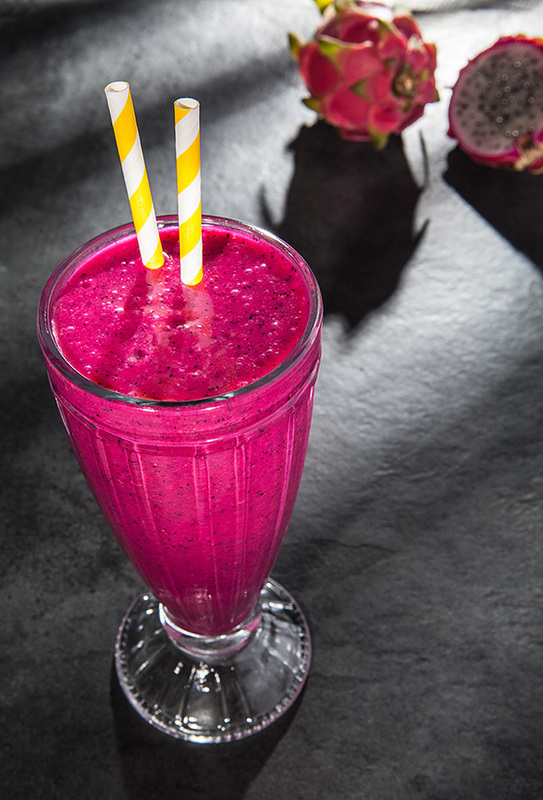 One recent shoot was for Pink Pitaya, a Gold Coast company supplying pitaya (AKA: dragonfruit) to cafes, restaurants and health food stores in the region. 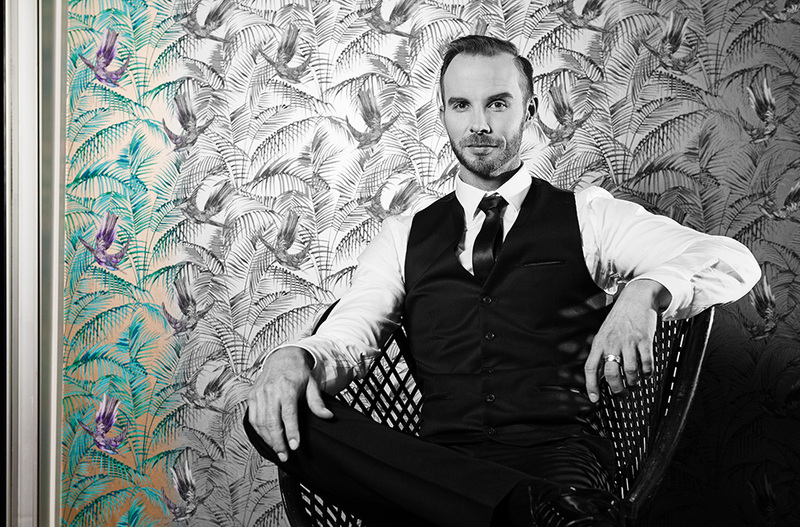 Ross Melene is a Gold Coast vocalist who I had the pleasure of photographing recently. 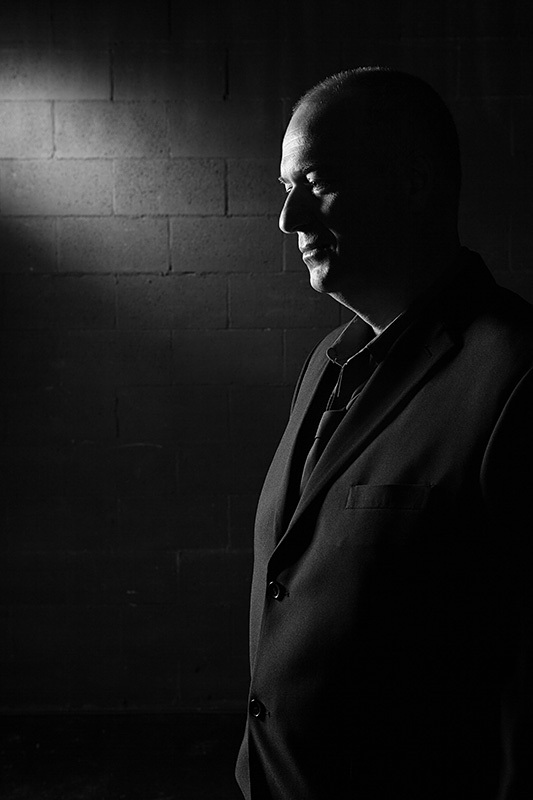 Ross needed a portrait for his marketing that was more stylish and moody than his previous head-shot photos. As an accomplished crooner and Frank Sinatra cover singer, Ross’ photography brief stipulated a nod to the classic photography of this ’50’s and ’60’s era. The results were a handful of portraits that Ross is super-happy with. The photo shoot took place at my studio though looks as though Ross is backstage at an old club. Look out for these posters advertising Ross’ upcoming Gold Coast and Brisbane gigs. / Comments Off on A Big Blue Sky outlook for the Gold Coast. A Big Blue Sky outlook for the Gold Coast. 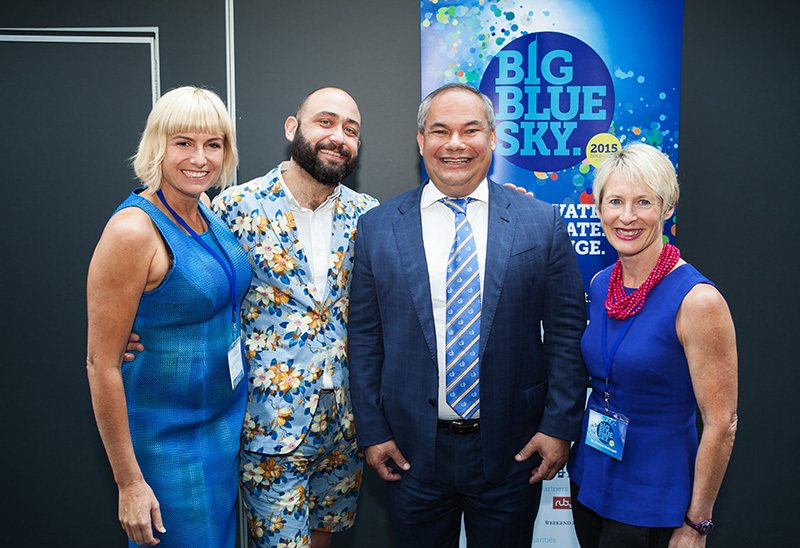 Last week I attended the inaugural Big Blue Sky event at Q1 on the Gold Coast. This was an opportunity that came about after a meeting with my client, Karen, from Gold Coast Food & Wine Tours, who introduced me to her business mentor, Susan. Susan and I gelled almost immediately and got chatting about her past work writing about social justice issues and the UN’s Communications Department. To be honest, this shared passion of ours hijacked the meeting and the photography aspect was almost lost sight of! I later shared some of my past writing on social justice and foreign policy matters and voila, was invited to participate in this most amazing of events. 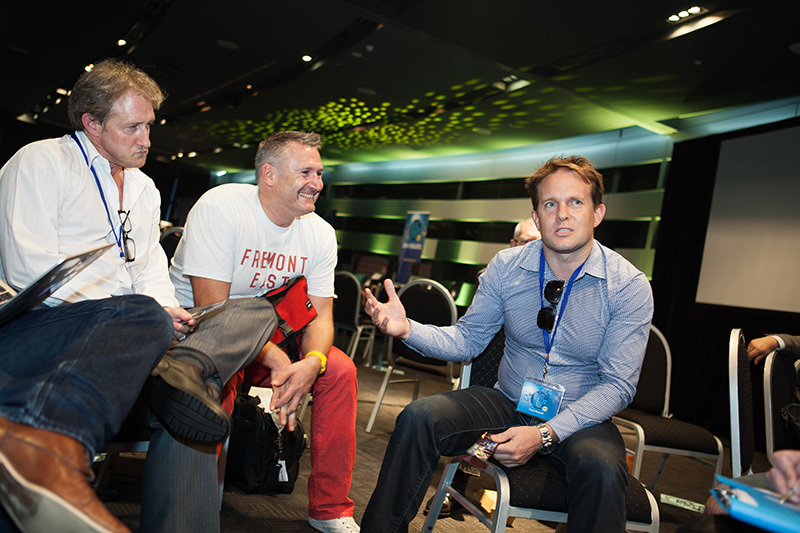 Big Blue Sky is an initiative that aims to change the way that business is done on the Gold Coast. 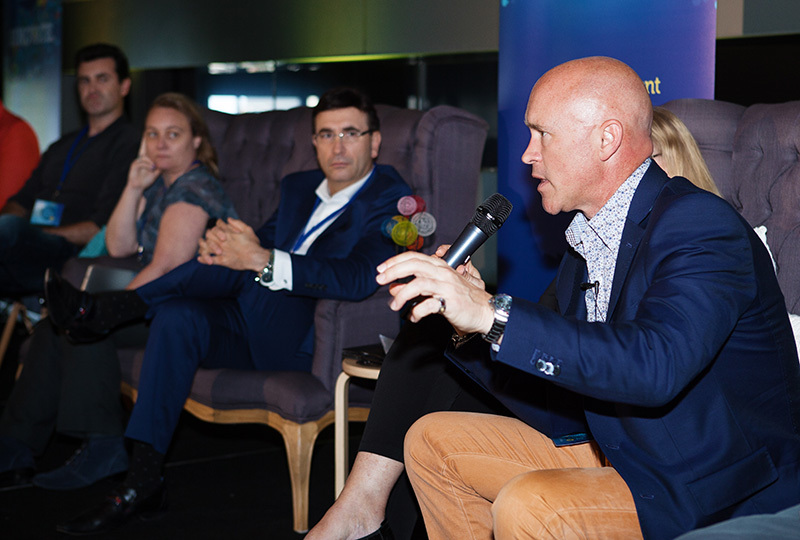 More broadly, the ‘moonshot’ essence of it, is to change the entire paradigm of the Gold Coast from that of a somewhat tacky, unrealised city in the true sense of the word, to a progressive, community-led destination for innovative businesses, that will enrich the existing community in many more ways than just professionally. Vibrant, engaged communities self perpetuate positivity and flourish. Academics aside, this is the true heart of the Big Blue Sky initiative. 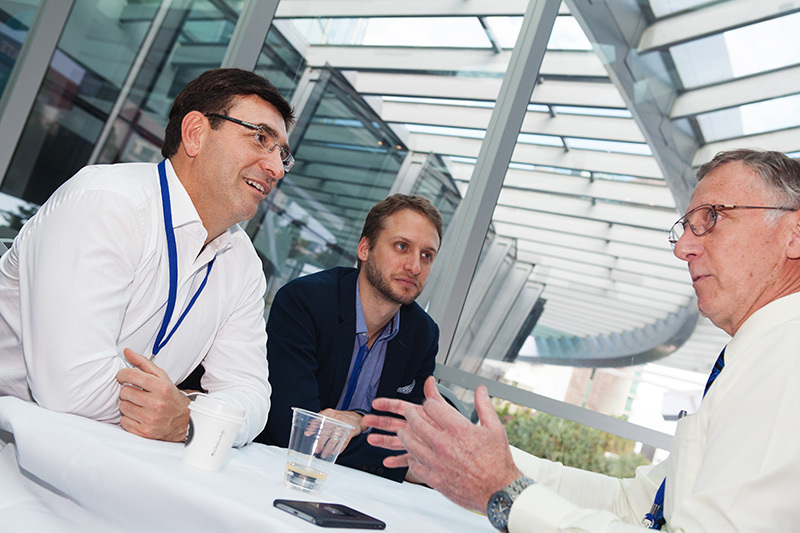 Crucially, this is a new model for sustainable and ethically sound business. It’s a grass-roots movement of critical thinkers and entrepreneurs who have decided to be proactive in creating the change that we’ve been wanting to see and have run out of patience in waiting for what we believe to be inevitable. 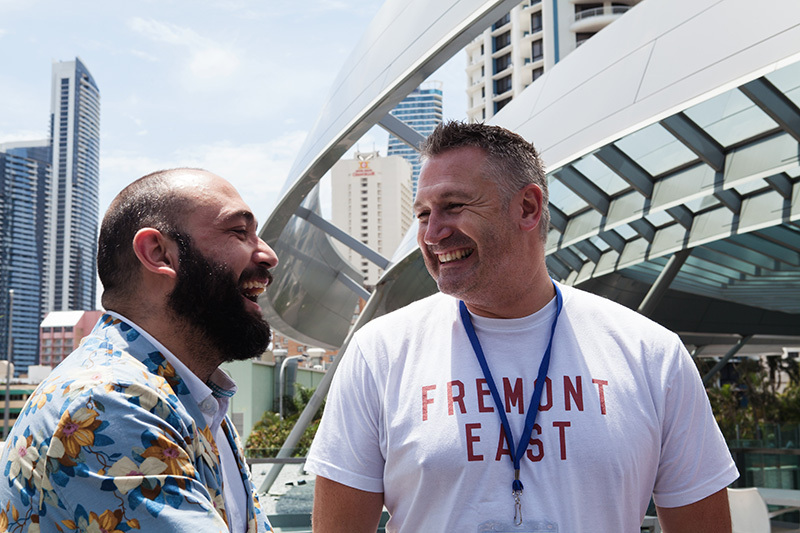 Big Blue Sky is a community-led, inclusive enterprise that began with a day of keynote presentations from some of the most dynamic and sought-after change-makers in the world. I’ll be honest and say that being involved fundamentally changed how I see the Gold Coast’s future and how I approach business. I’m still digesting everything that was discussed and being intellectually out-gunned in such dramatic fashion, this process may take a while!!! So now the true work begins. 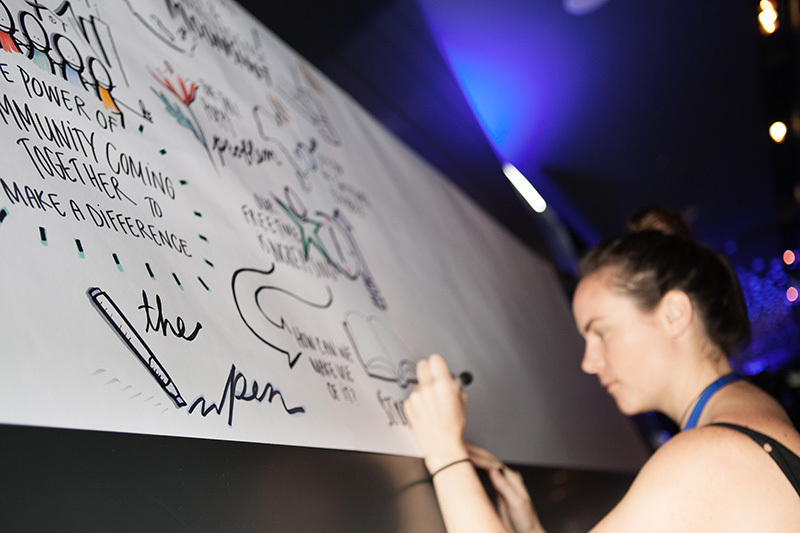 We workshopped ideas broken into 3 ‘Moonshots’, which will be developed over the coming year, in preparation for major progress reports at the next event in November 2016, as well as infrastructure being put into place during this time. You can read more about these Moonshot specifics here. This work is voluntary and I encourage anyone who has professional skills to offer, to get in touch with the team or myself for further information, where you will be brought up to speed and supported in any way that we can help us all reach these lofty goals that will benefit everyone on the Gold Coast. Mayor Tom Tate has leant his support to Big Blue Sky after being exposed to the calibre of ideas that the day produced and it’s great to see a member of the establishment recognise that communities need to be democratic, organic and less hierarchical. This will only speed implementation of the positive change. / Comments Off on Food shoot madness at Paul Williams Photography! Food shoot madness at Paul Williams Photography! It’s been a long time since I posted here on the blog for Paul Williams Photography. 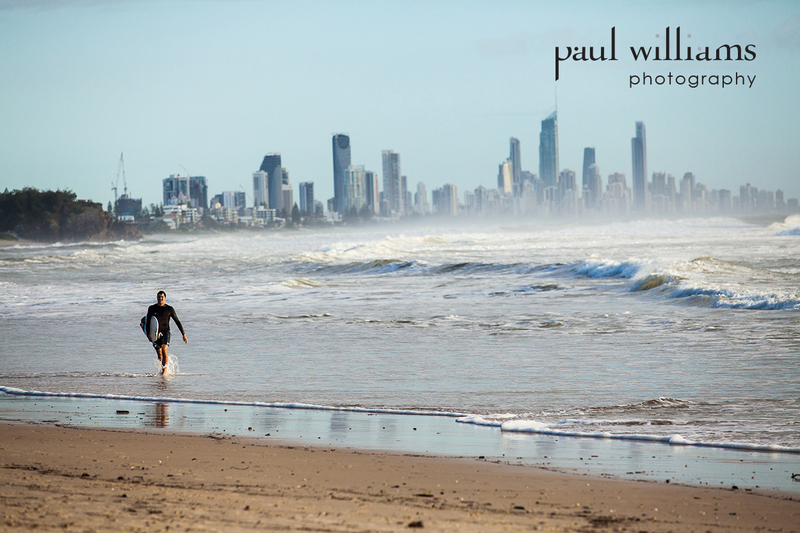 The Gold Coast and Brisbane have been busy places of late – plenty of shoots, which is great! Most of what has kept me busy has been food photography which has also seen me pick up a few new clients as a result of our maiden food shoots together, including the Zarraffa’s Coffee account. Good times. Some of these photo shoots you can read about over at my dedicated food photography site at www.GoldCoastFoodPhotography.com. The direct link to the blog is here. A lot of great food photography work has also been shot lately with Gold Coast food stylist, Pete May, who brings an enormous amount to each shoot for my f&b clients. You can read a little more about our food photography exploits here. A proper blog article will be tapped-out as soon as I come up for air with my current shoots and digital retouching deadlines! Until the next! I’m very pleased to announce that I’ve just won the 2015 DesignFirms award for branding. The awarded brand identity job. As many of my design agency clients know, I worked as a Senior Graphic Designer prior to moving to photography full time in 2004 and when certain projects arise, I like to keep my hand in the design game. This allows me to remain relevant with my agency clients and informed of design trends. Photography is so closely tied to graphic design, so by remaining aware of design, I can maintain the advantage that I have over other photographers by keeping the designer in mind when shooting for the collateral that they’ll be using my images in. I’ve actually had eagle-eyed designers in the past, guess that I used to be a designer when reviewing my photography folio and others also tell me that this is the reason why they prefer me to shoot their image content. How they guessed that, I’ll never know! 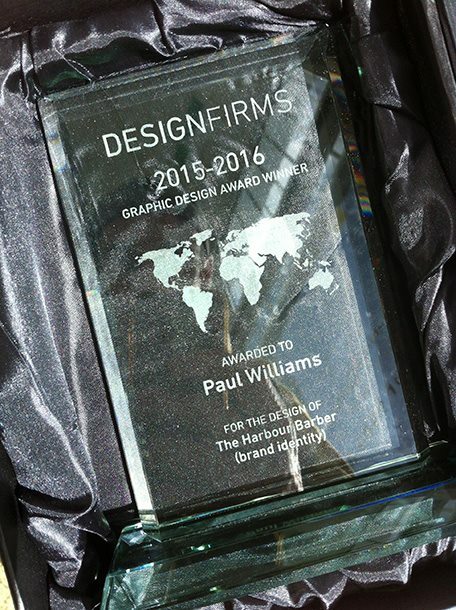 This branding award came around when late last year, I was contacted by a client who I shoot for named Harbour Day Spa in Cleveland (South Brisbane). 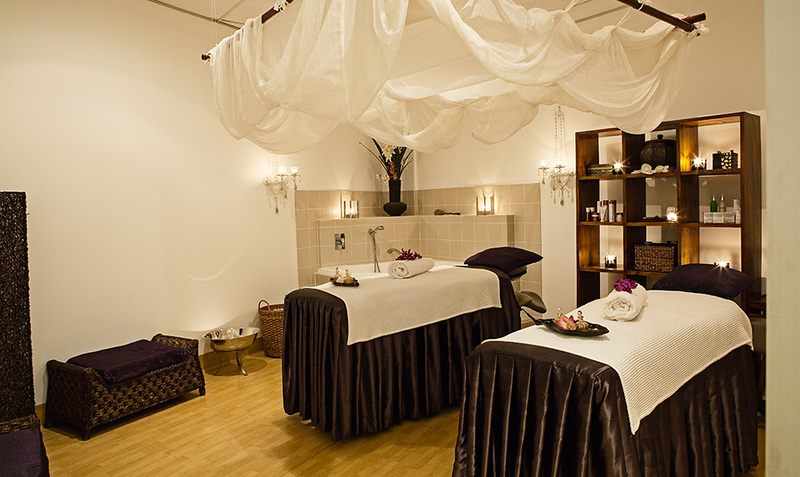 Aware of my background in branding, I have consulted with and written copy for the day spa; and in 2015, they improved on their ‘Best day spa in Australia’ crown, by being named ‘Best luxury beauty spa in the world’ at the World Luxury Spa Awards 2015. Amazing! The owners were looking to start a barbershop solely for men, annexed to their hugely successful spa, for two reasons. The first, was to capitalise on the ‘bored husband’ crowd that were dropping their wives off, then leaving to fill an hour elsewhere. 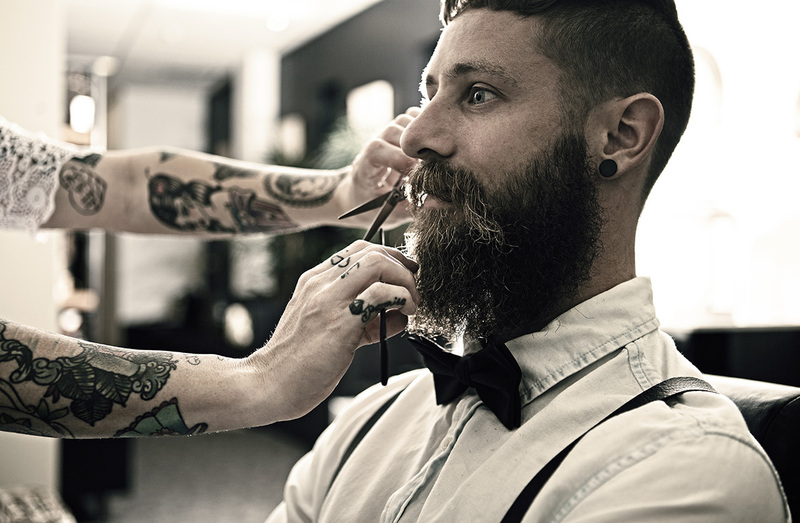 The second motivation was the growing trend of barbershops for the image-conscious modern man of the Gold Coast/Brisbane region. 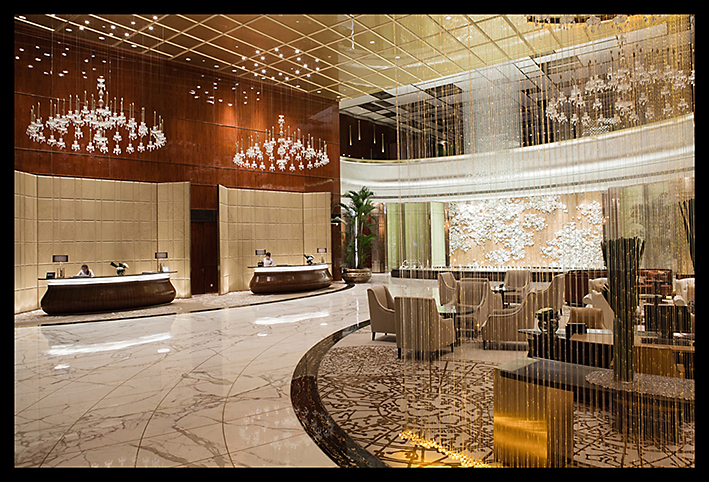 / Comments Off on Interiors photography tip: How to achieve correct white balance in a mixed-light interior. 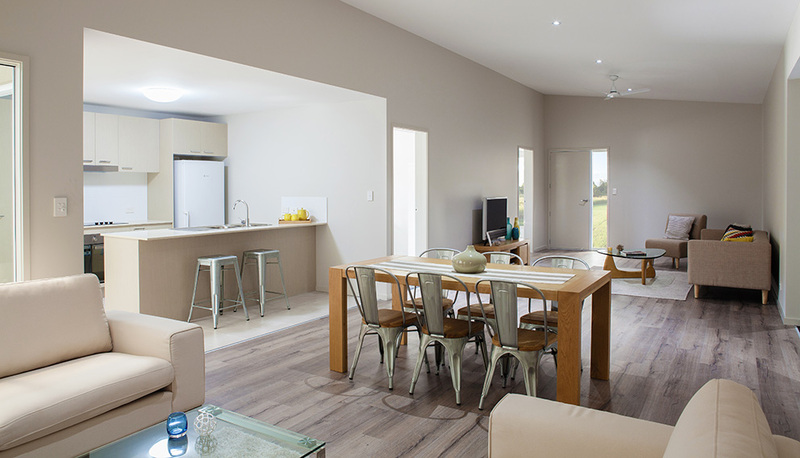 Interiors photography tip: How to achieve correct white balance in a mixed-light interior. 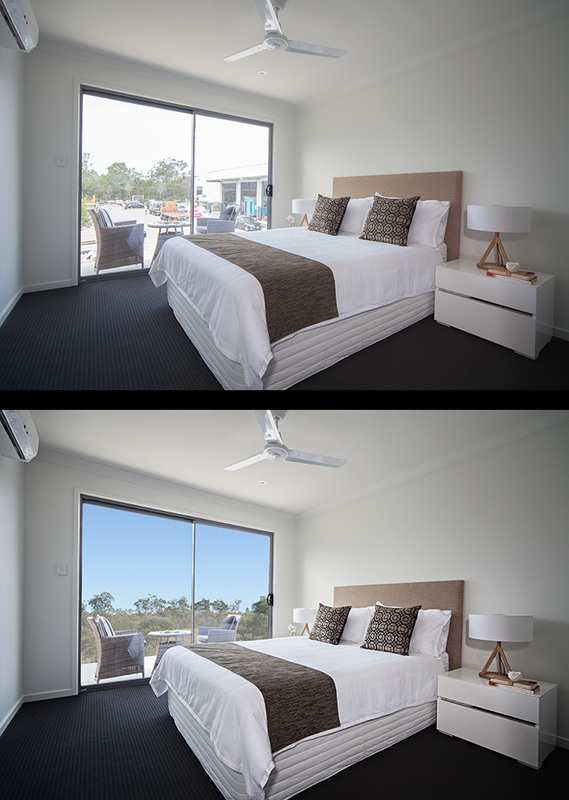 A few weeks back, I shot interior photography for Bignote Productions on the Gold Coast. 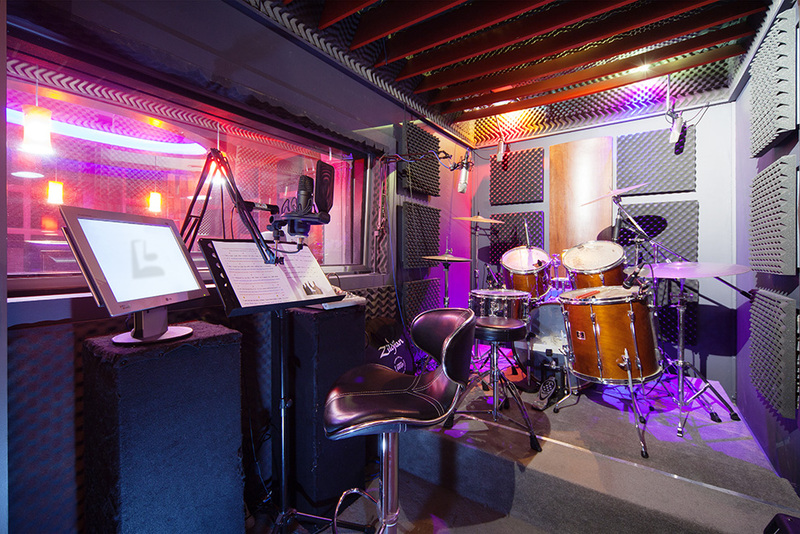 The recording studio environment provides a number of challenges such as limited time and positions to shoot from, and while I was assessing the main issue of white balance, it occurred to me that the best way around this issue would be a helpful blog topic for amateur photographers. So here we are! In the days of film (not so long ago), a photographer would decide which of the lights is the most dominant in the room and use that as a starting point. If it was tungsten light for instance (a regular light bulb), any additional light needed from the flashes would need to be balanced in colour, so the cooler flash light didn’t appear as blue. This was achieved by covering the flashes with a special orange gel (made from a type of cellophane), to warm the light and match the ambient tungsten light in the room. If there was a range of different lights with different colour temperatures, this became a very time-consuming task. Step 1: Prepare the room, then when it’s ready to shoot, take a shot with the colour card placed in the scene close to your main focal point. Step 2: Remove the colour card and shoot the scene again, changing nothing. Step 3 (post-production): Take your dropper tool to sample your levels and set the white balance in your chosen processing software (eg: Adobe Bridge). You should be sampling from a mid-grey square on the card – usually 18% grey works well. The row of varying greys on the card is to allow you options in how warm/cool you’d like the shot to look. Step 4: When you clicked on your grey colour card square with your dropper tool, you will have noticed the white balance values change. Simply apply the same white balance settings to your final shot, which doesn’t contain the colour card in the scene. There are so many uses for the colour card – this is just one. I also use mine religiously when shooting portraits in mixed light that I can’t control, so I can be confident that the skin tones are accurate. Hopefully this photography tip has been helpful to someone out there and will save you from ‘chimping it’ in your workflow by guessing colour temperature and hue levels. Happy shooting! Here is my new logo to freshen up the old logo that was designed in 2004, when I first started shooting professionally. It was definitely time for a freshen-up! The original logo was inspired by the grungy film edge patterns and textures that were popular at the time in design. It served it’s purpose as a young and slightly edgy identity, but the 3 words needed to be ‘stacked’ when using the logo at a small size, in order to remain legible. I never really liked the stacked version of this elongated logo, plus the relevance of the film that I used to shoot on is now redundant. The new logo is a typographic solution which is much more elegant. The typography is fully custom, with some interesting character to the ascenders, descenders and the a’s. The root typeface was a serif, which I decided to subtly morph into a sans serif top half for the characters. This more traditional-style serif font is a subtle nod to the start of my career (shooting on traditional film), before the characters grow upwards and modernise into a sans serif typeface. Have I lost everyone other than the Graphic Designers by now?! Anyone…? Anyone…? Keeping lower case for the p and w solved the problem of balancing particularly the p, which is one of the most troublesome characters to work into typography. All in all, I think this is a really nicely balanced logo and the design process was a highly gratifying task that I’d put off for too long! Onwards and upwards! 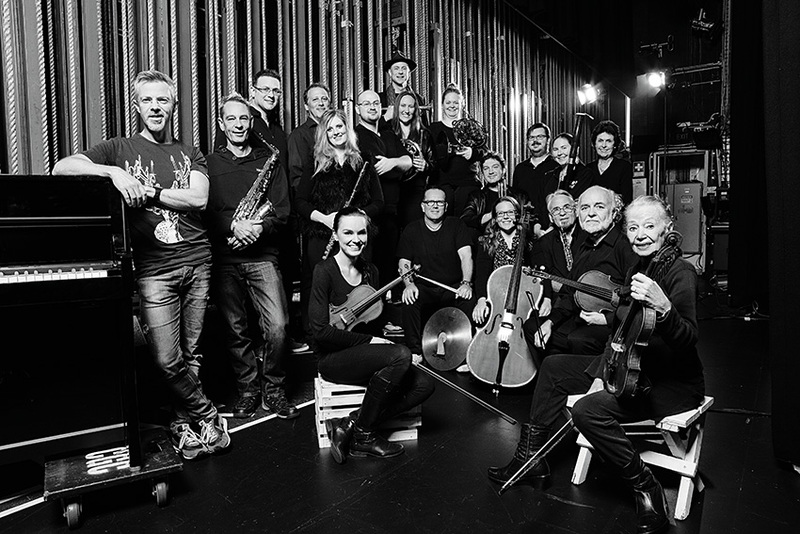 Last week I met with the orchestra for the new musical theatre production at The Arts Centre Gold Coast. The musicians playing down in the pit for the audience are incredibly talented and often the unsung hero’s of a show (if you’ll pardon the pun)! Pictured is the official portrait that The Arts Centre asked me to shoot and I just love the backstage location with all the theatre rigging. I chose to leave my back-lights in the shot, as I was using barn-doors on the lights which gives them the same look as stage lights. 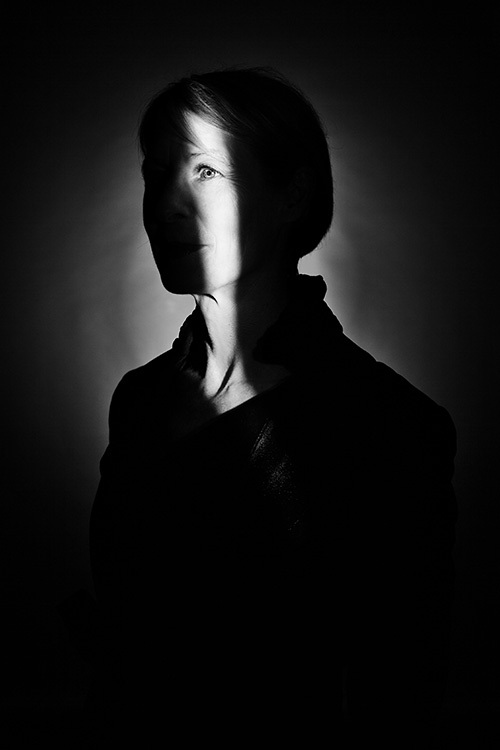 This adds to the theatrical feel of the portrait, which I’m really happy with. 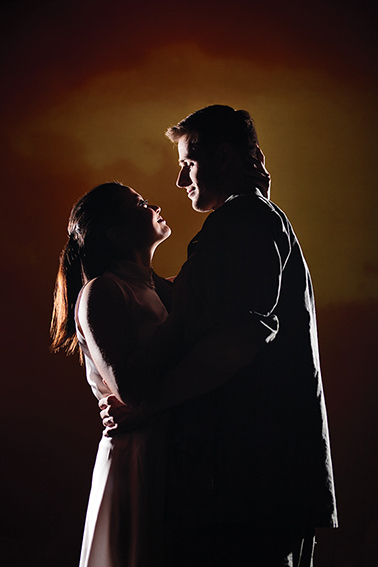 / Comments Off on Miss Saigon comes to the Gold Coast! 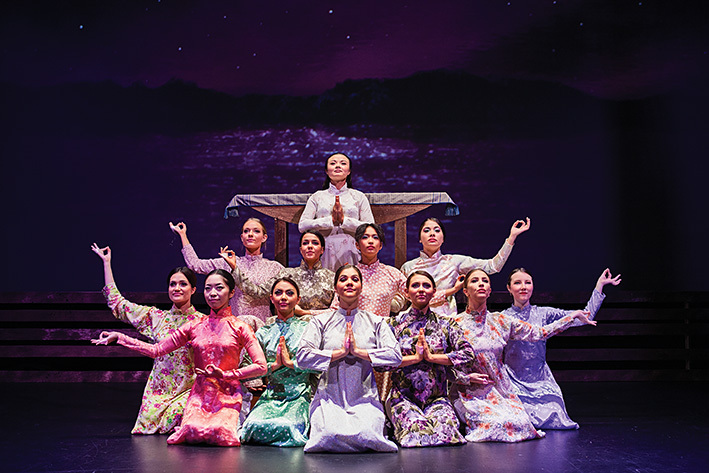 Miss Saigon comes to the Gold Coast! 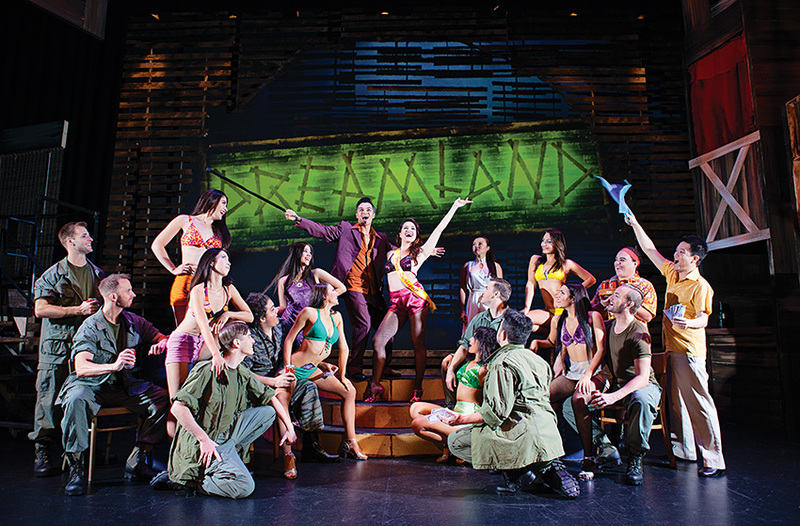 Last week I was asked to photograph the hero shot and program imagery for the new theatre production at The Arts Centre Gold Coast. 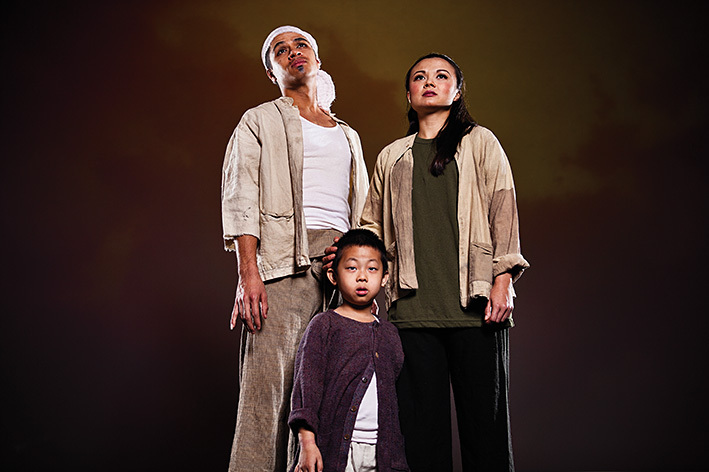 ‘Miss Saigon’ is set during the fall of Vietnam at the end of their civil war, and addresses some of the many issues that arose from the USA’s illegal interventional policies, both at the time of the conflict and during the decades since. The Arts Centre have created a beautiful range of stage sets which were great to get a chance to see and incorporate into the shots. Their talented cast were great to shoot and the crew very helpful in assisting with the theatre lighting to complement my studio lights. My kind of shoot! 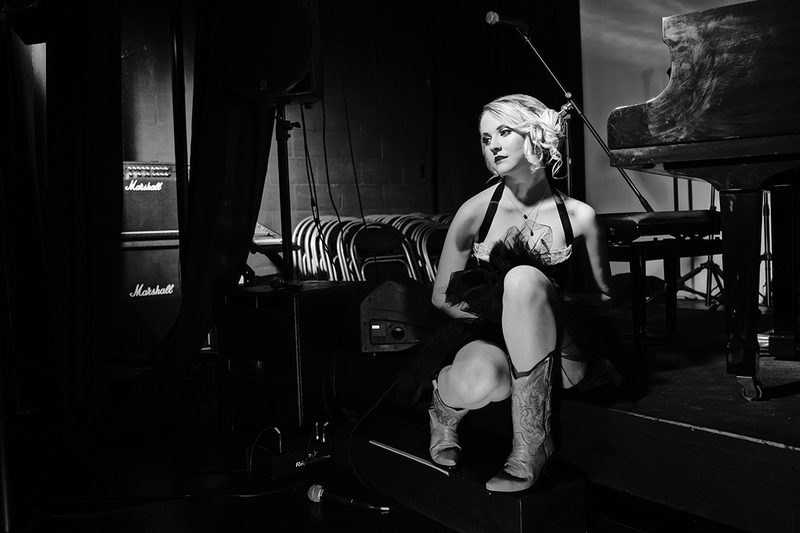 Two weeks ago I shot the new album cover for Lauren Lane – a young Gold Coast country/folk singer-songwriter. Her upcoming album title is ‘In my head’, so I wanted the shot to reflect an intimacy that is fitting for this very personal collection of songs. By posing Lauren with an old suitcase of keepsakes and unspecified treasures, this shot becomes a nice visual representation of the emotions and experiences that Lauren’s expressing lyrically on the album. Lauren was really supportive of the art direction and was fantastic to work with. She took direction well and managed some challenging poses like a pro! I must also thank Kristen Wyborn for doing such a great job with the hair & makeup. Kristen airbrushed Lauren’s makeup for the shoot, in order to avoid using oil-based makeup with a shine to it and the results held up great for the duration of the shoot, which was excellent. This album cover shot was a very ambitious 5 light setup that needed to be nailed and balanced throughout. From the window light cast across the back wall (all done in-studio), to controlling the spill from the kicker flash placed in the suitcase, this is a shot that I’m really proud of. Most importantly, the client is beside herself with the shots, so check out Lauren’s music HERE and support a young Australian’s music once ‘In my head’ is released! As clients’ marketing results improve greatly with the use of high quality photography, they have the comfort of seeing their advertising spend as highly justified. 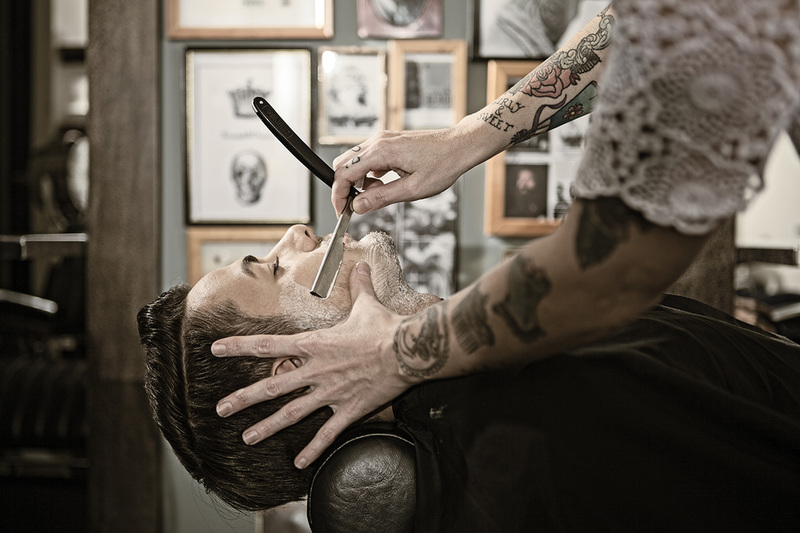 The good-will that has built from my clients’ success seems to be building in the form of recommendations and I somehow now find myself as a go-to photographer for hair salons, barbers & day spa’s in the Gold Coast & Brisbane region! Am I soon to meet the shadowy Don of the manicured mafioso as I shoot more and more highly awarded hero’s of hair styling?! 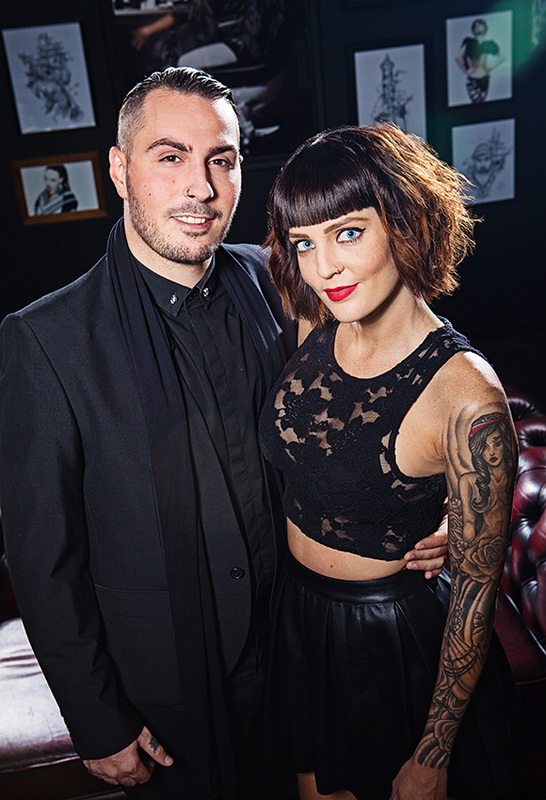 Together with his wife, Joanne, I shot Quentin and their team in the salon which is thankfully a very cool space. For the group portrait, I chose to leave the back-lights in the shot, tying-in their relevance to the salon’s cool lamps in the lounge area. 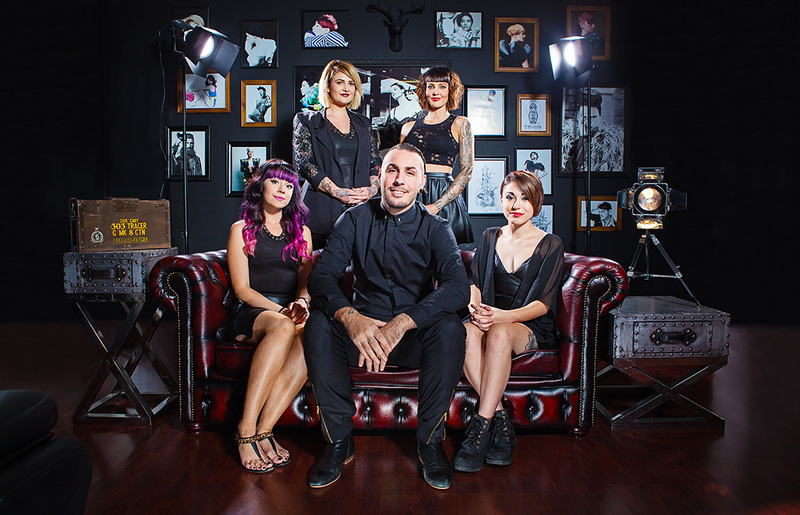 This also gives the shot further relevance for use when the B&B team achieve their future goal of expanding the salon to include a photography studio, showcasing their award-winning cuts & treatments. The client’s are ecstatic with the interior shots and of course the portraits which rightly portray the staff as they are – colourful, edgy and highly approachable. 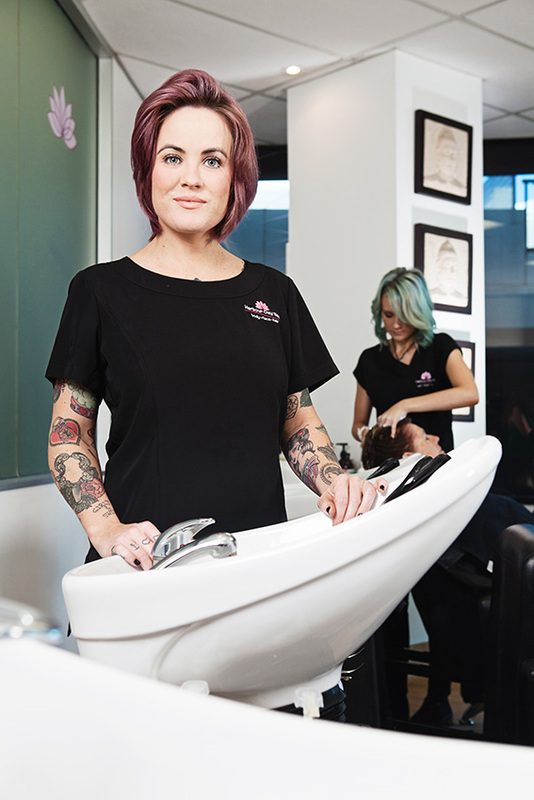 The B&B team really are artisans at their craft and do amazing work, so if you’re getting a little on the fluffy side, get yourself down to the salon and experience some of the best in the business on the Gold Coast. There is no doubt in the value of good photography when it comes to marketing property developments and private real estate. Good interior & architectural photography will generate more interest from prospective buyers, show real estate in it’s best light and provide the literal and figurative best angles that marketers need to quickly sell the property for the highest achievable price. Property developments that I’ve personally shot, have sold out purely based on the sales brochure. But shooting a show home to achieve such impressive sales results can present certain issues to the photographer, that we must find solutions to. Some of these solutions are resolved ‘in camera’ on the shoot day. Other photographic issues are unresolvable while at the property being shot, though can be fixed in Photoshop. This, is the art of image retouching. A perfect example of this was a shoot that I was recently asked to do by my client, ABC Construction. This was a photo shoot that required a good deal of practical solutions whilst shooting both the interiors photography and the architectural/exterior photography. With an incredible product in the form of a 2-storey steel kit customisable townhouse, a show home was constructed in ABC’s factory car park for visiting property investors to inspect, but a car park is not what remote investors want to see when browsing a sales brochure. They want to see a finished home ‘in-situ’, to demonstrate both a track record of project completion and a fully landscaped ‘home’ that they can sell or call their own. I’ve included a few samples of the ‘before’ photo that I shot for ABC and the ‘after’ image which I retouched for their sales brochure. Ensure that your vertical lines are vertical. Without this, walls can look unstable and it’s more obvious which rooms have been shot with a wide angle lens to make the property seem more spacious. To create punchier, high contrast images while maintaining BOTH highlights and lowlights, ask your image retoucher to run a HDR treatment on your images. This can be particularly effective for photos that have for instance, a bright window at one end of the room and a darker corner at the other end. Ensure colour accuracy by asking your photographer to shoot with a colour card in the test shot. This will allow them to balance any varying light types (eg: when external dusk light and interior lights appear in the same photo). This creates or corrects blown-out highlights, or can create a window view. It’s important that views being dropped into windows don’t look too contrasty, or they’ll look fake. To avoid this, generously brighten the window view as it would appear to the human eye. If you need to replace or enhance the sky in an exterior architecture photo, it’s important to not push this too far. For instance, a property shot on a very cloudy day would ideally not have a full sun sky dropped in, as the light won’t look ‘rightly matched’, even to the eye of an amateur observer. If the sun can be seen in the sky, ensure that it’s on the side that makes the ‘shadow throw’ make sense! Similarly to the above, it’s vital that the light is matched for any sourced images. Shadows must fall in the same direction and with realistic opacity. Perspectives must match and overlapping objects must blend and obscure background objects seamlessly. Often photographer’s are asked to shoot property interiors that are incomplete or haven’t been ‘snagged’ by the builder yet. Removing wall scuffs, cabling hanging from missing light fixtures and unplastered skirting and plaster are common image issues for retouching and vital to allow budget for if the property is to be photographed less than 100% complete. If you are a property developer or require real estate to be photographed and/or professionally retouched, please do get in touch. 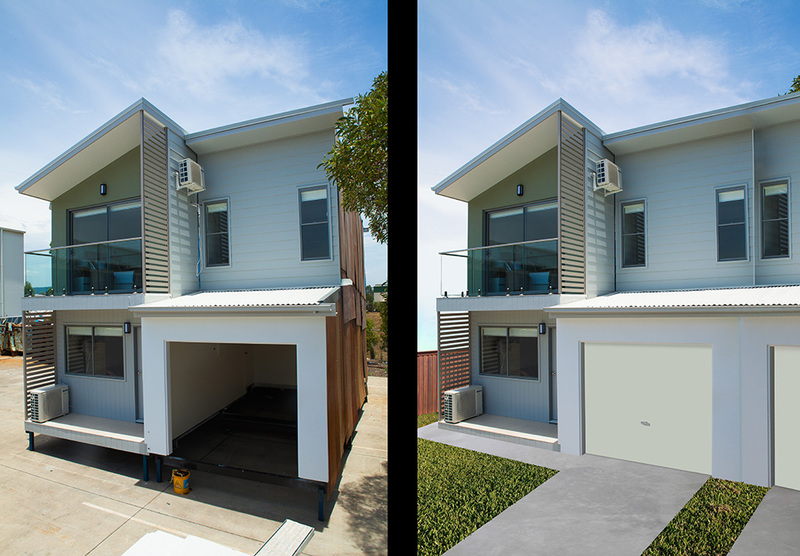 I am based in the Gold Coast and Brisbane region of Australia, though have been contracted to shoot properties all over the world by both property developers and design agencies. Some of my interiors and architectural work may be viewed here. 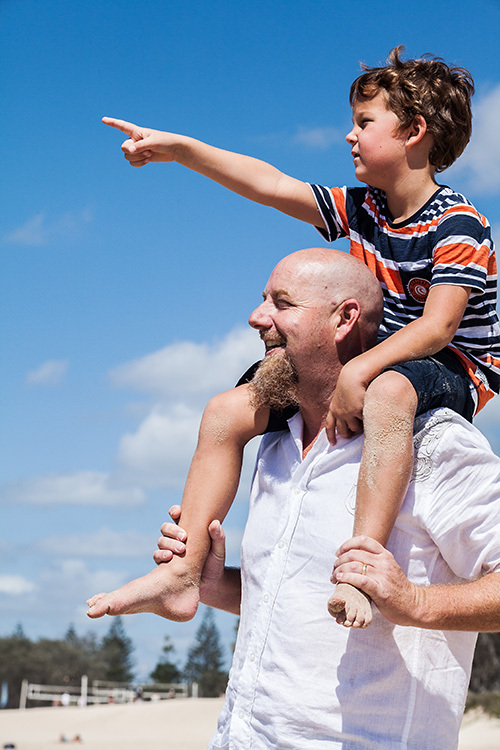 Last week I shot some lifestyle photography for Seachange Developments on the Gold Coast. 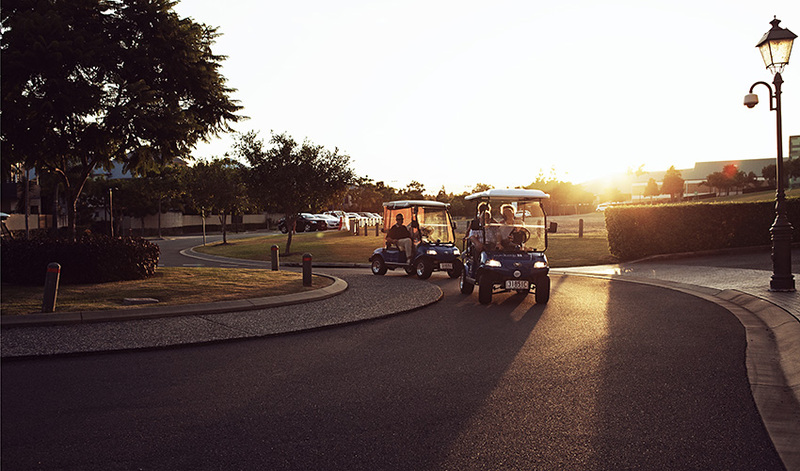 This very fun photo shoot involved shooting out the back of a golf cart, as 10 other carts followed, whilst winding our way through one of Australia’s most impressive over 50’s lifestyle communities. Seachange Emerald Lakes really made me think that retirement can be one long laugh, as the residents cruised around the buggy-friendly community to choose an f&b venue for the night, before cruising home with a few wines under the belt and no transport issues! 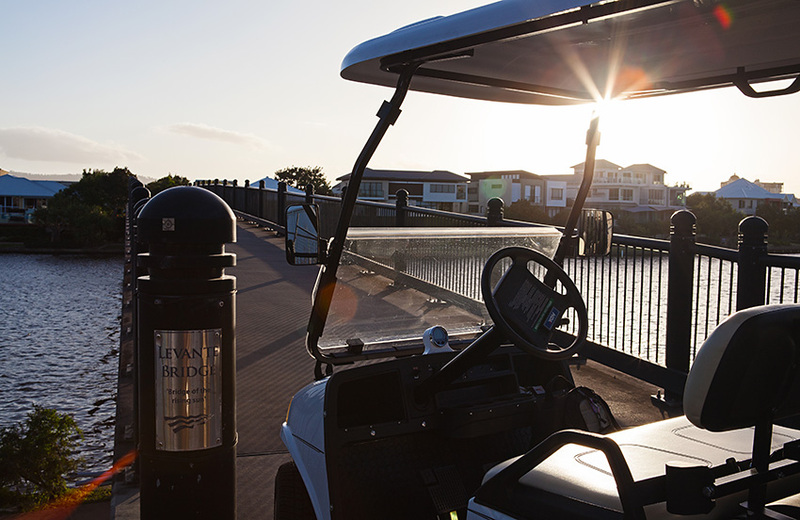 We got some nice vehicle shots and people shots showcasing this lifestyle on the ‘Bridge of the rising sun’, and the surrounding streets that are lined by an 18 hole golf course. You can read more about Seachange Emerald Lakes here. 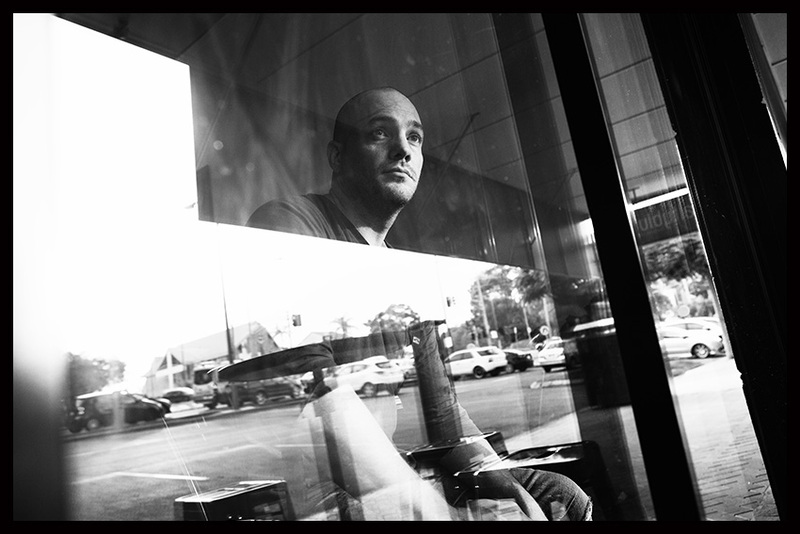 Gold Coast musician, Alby Carter, recently contacted me to shoot a fresh suite of publicity photos. 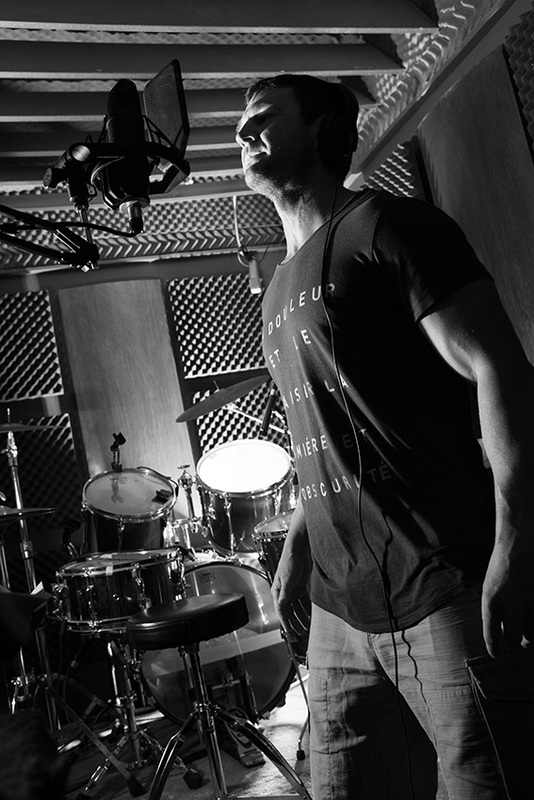 I’d met Alby before when I shot him during his studio session at Bignote Productions on the Gold Coast. We decided that casual urban locations would be ideal for Alby’s highly relatable music, so headed to Burleigh Heads for an hour of shooting in various venues until asked to leave – proper old school production that took me back to my old days of shooting on film and dodging security guards! Heh…. After a nice old time strolling and chatting with one very nice dude, we came away with some great shots that work together really nicely around strong black & white compositions and a theme of reflections. I’d chosen this approach for two reasons; the first being the nature of Alby’s pensive song lyrics and his serious return to music after a hiatus. The second reason being the lack of architectural charm on the Gold Coast meant that a more creative approach was going to be needed for this kind of urban environment. 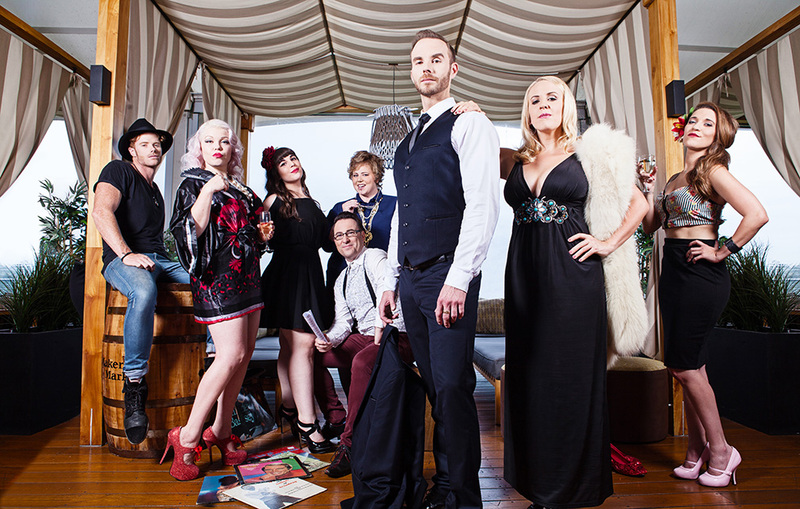 Recently I was asked to photograph the album cover for The Green Room Project – the Gold Coast’s live monthly cabaret talk show. The brief for the photography was to allow the personality of each group member to be shown, so a wider shot with a range of interesting poses allowed this, while also allowing the models to interact with each other. The striped marquee on the shoot location leant a theatrical feel to the photos, with some great wardrobe and props completing the styling! 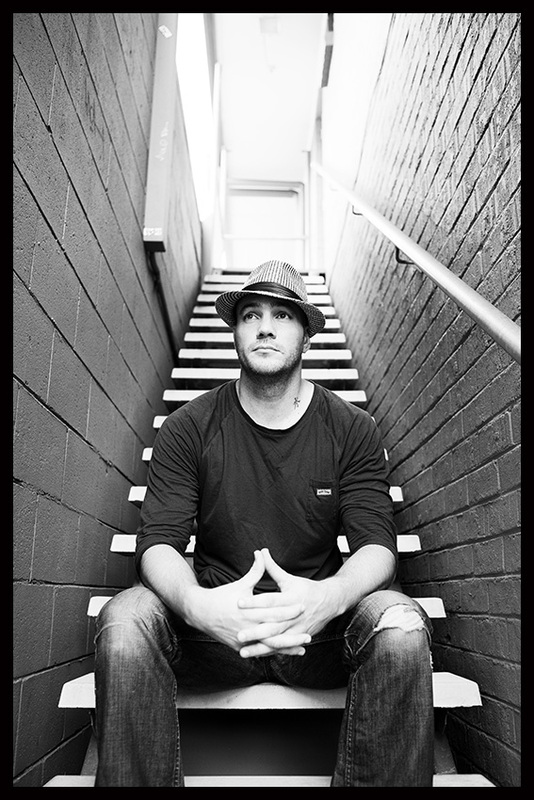 Host, Matt Ward created The Green Room project as a novel way of showcasing emerging and undiscovered music talent, combined with mentoring by industry professionals. 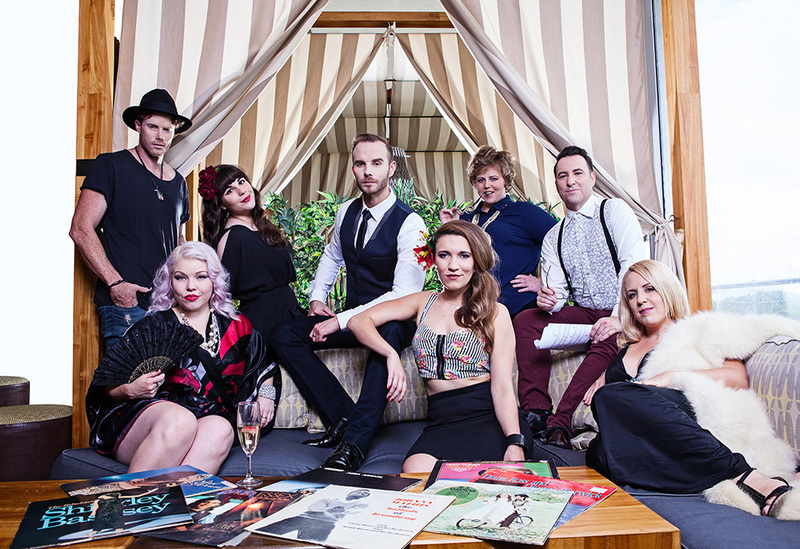 Recorded at Bignote Productions, six of Queensland’s most talented musical theatre and cabaret performers who have been featured on the show came together for the compilation album and were accompanied by musical director, Brad Rush, on a baby grand piano. 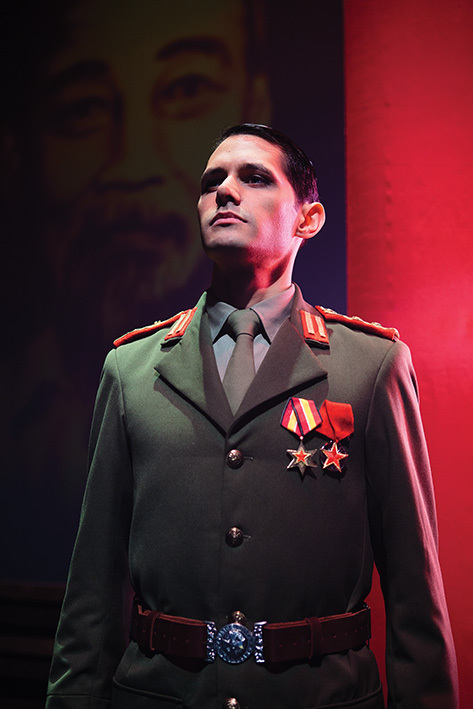 If you’re in the Gold Coast / Brisbane region, you can check out more details of this great concept here, as either an audience member or musician! 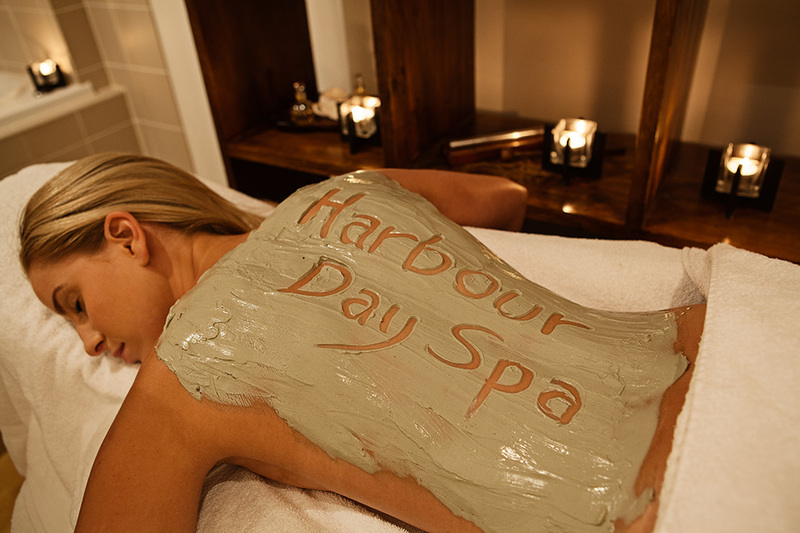 A few weeks back, Harbour Day Spa in Brisbane’s Cleveland area were looking for a lifestyle photographer to refresh their image content, having just been voted the #1 day spa in Australia. 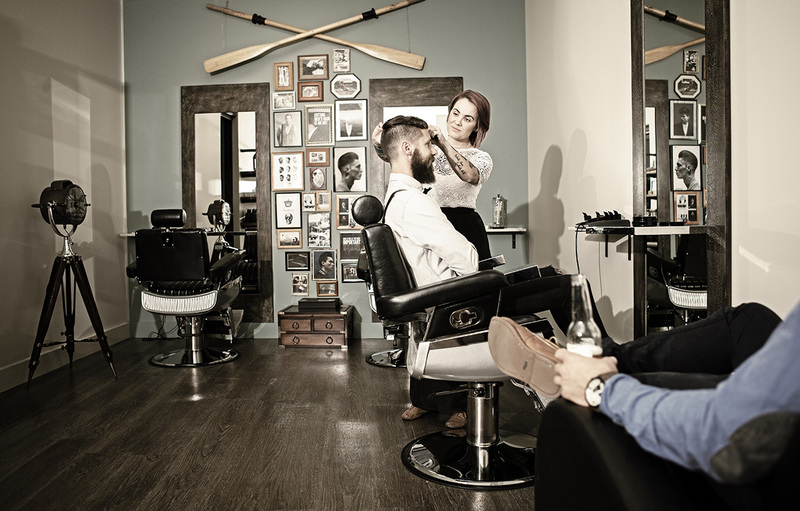 I got the call, having already shot a really nice lifestyle campaign for their offshoot brand, The Harbour Barber. Tracey, Lea, Tash and the rest of the team are such lovely clients and the spa is of course an extremely relaxing environment to be in – even when you’re working! The shoot was excellent, with a range of quality people, interiors and product photography shot to refresh their brand’s image content for the coming year. The thing I like most about this client, is the fact that they truly ‘get’ branding. They understand that you need an actual commercial photographer to shoot your image content for you (not a cowboy with a camera) and that Instagram is not a replacement for this need. They keep their image content updated and delegate their creative to photographers and designers who develop and execute strategically, as opposed to banging out flyers and fixing crap photography with HDR and other filters in Photoshop. The photography side of the business for me was amazingly busy for the last quarter of 2014 – and this blog very much fell by the wayside! 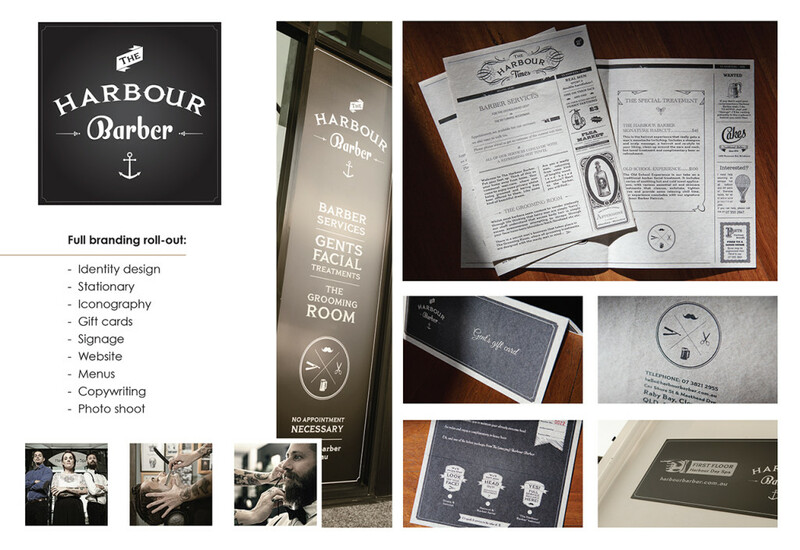 One of the best projects that I worked on over the manic year-end was the brand identity that I designed for a hip new barber shop south of Brisbane, named ‘The Harbour Barber‘. I designed the logo and full identity for the client, from brand strategy through to all of their print collateral and web design. A subsequent photo shoot followed (naturally! ), the results of which are featured here and have featured in 4 or 5 national magazines and newspaper supplements since. 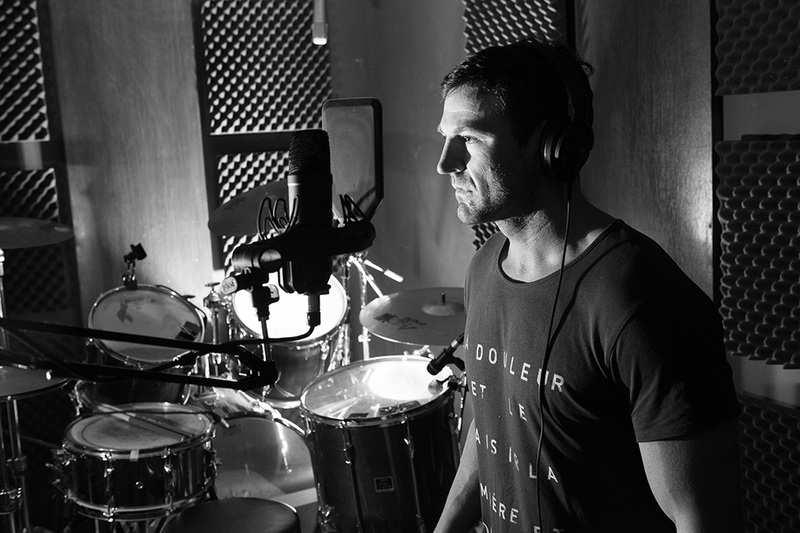 Last week I photographed Gold Coast singer/songwriter, John Hosking for his CD single artwork. John was at Bignote Productions recording a very pensive track and I wanted the photos to reflect the ambience of the music in this black and white portrait, which is more classically lit. I shot an additional portrait of John in studio 1 at Bignote, which is a great working portrait set against the backdrop of studio gear and the acoustic ceiling. John’s pumped with the shots and asked me today to shoot his upcoming album cover, so looking forward to collaborating with the man again! 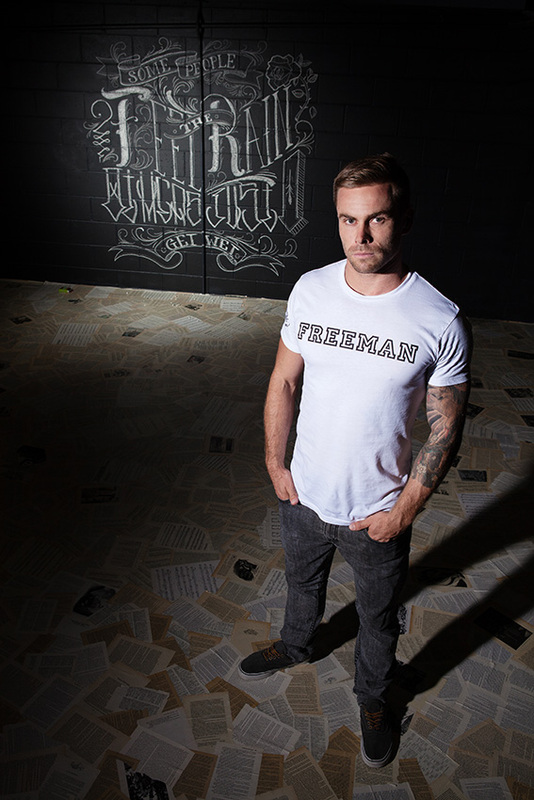 Last week I shot Gold Coast fitness celebrity, Sam Wallace, for his new website photography. Sam needed some quality fitness shots that showed him training a client as her Personal Trainer. The shoot had a few restrictions to overcome; we could only access a gym with a very low ceiling, making it tough to control the light. We were also restricted to landscape format shots, which would fit the format of the website’s UI. Regardless of these, as well as space restrictions, we had an extremely productive evening and got a range of shots that I’m really happy with – and importantly, Sam is “pumped as hell” with the shots! Lighting from overhead is often what’s needed to flatter a male physique, but side-lighting to allow for such a low ceiling managed to give really nice definition to the models’ muscles and also give them both great separation from the cluttered background. My fitness photo shoots will be getting more popular now that summer is on it’s way here on the Gold Coast and in Brisbane, so get in early if you’d like to shoot and email me at paul@pwphotography.net! 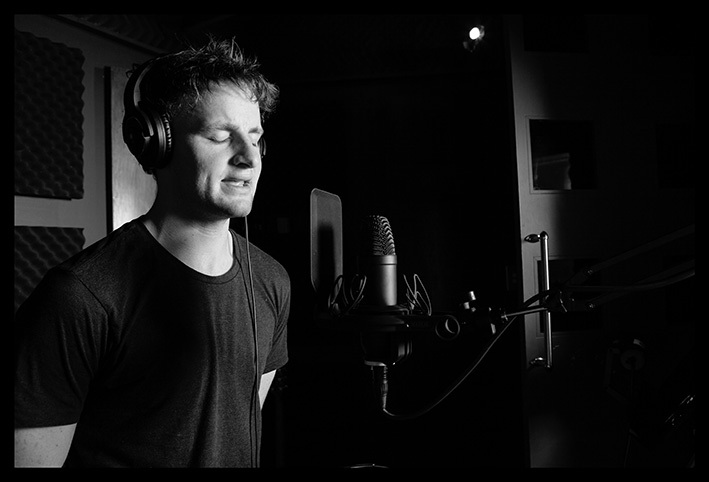 Last week I photographed singer/songwriter, Mitch King, in a recording studio session at Bignote Productions. He was tracking a new song for his upcoming album. This photo was taken through a porthole window to the recording studio. I like the rim-light in this shot and the blurred window frame that frames the shot itself – it reminds me of old Super-8 or medium format film. After the session, Mitch asked me to shoot his album cover next week here on the Gold Coast, which I’m very much looking forward to. The songs that he’s recorded for the album so far are awesome, so it’s a really nice project to be involved with. This was my 2nd shoot for Bignote Productions who, to my surprise, asked me to be their in-house photographer from now on! 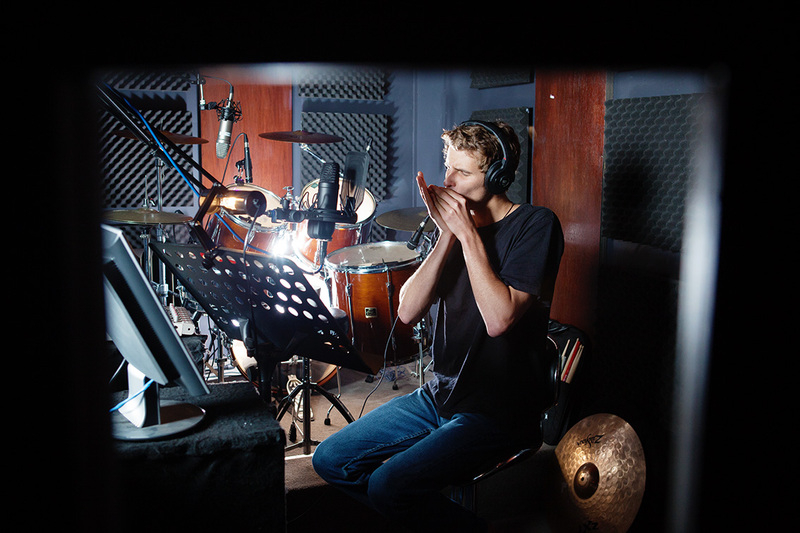 It’s such a talented team at Bignote and being able to provide photography for the musicians producing music at the best recording studio on the Gold Coast feels like an ongoing collaboration that will be a perfect fit. So if you’re looking to produce music and you’re in the Gold Coast / Brisbane region, drop by the studios here to say hello. You just might end up in front of my lens as my next blog entry! 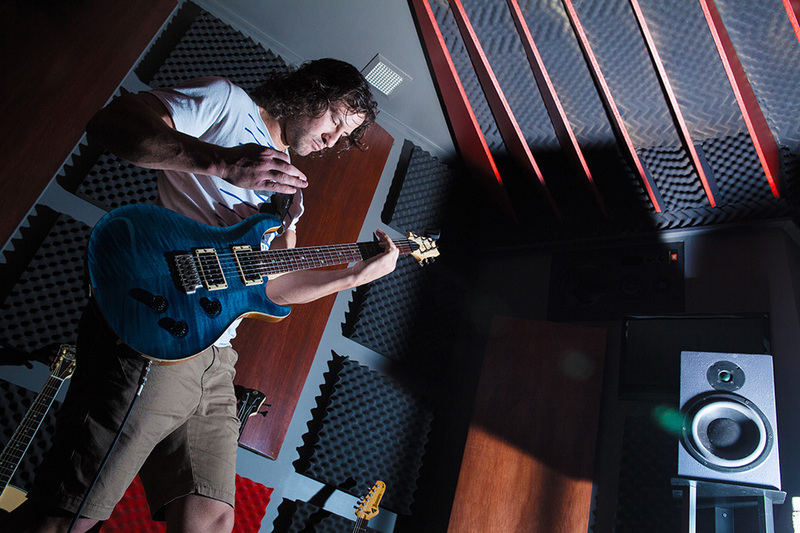 Last week I was asked to shoot a band recording a track for their upcoming album, at Bignote Recording Studios on the Gold Coast. I had just 5-10 minutes to shoot each band member while they were warming up, before their studio session began. This is a good example of what can be achieved even in such a rush, with just one small compact flash unit (triggered remotely). For the vocalist, I placed a 2nd compact flash unit beneath the drum kit to illuminate the skins and bring out the background details of the studio, while still keeping the emphasis on the sharp foreground subject. 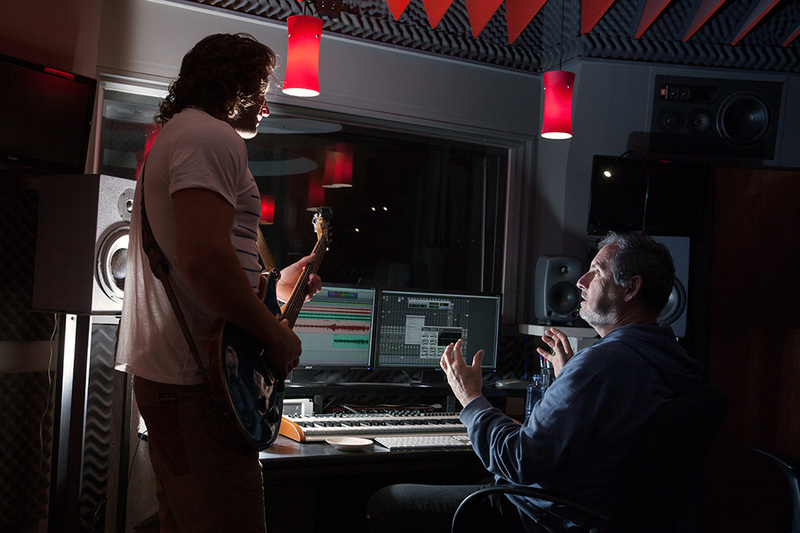 Everyone at Bignote was really happy to see the results of a photo shoot done within such time constraints and I loved having the chance to see the amazing music being produced there. 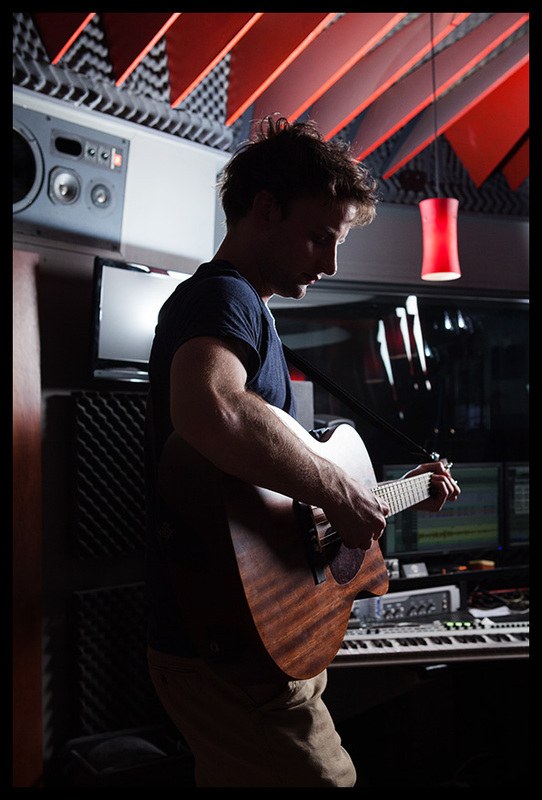 If you’re a band or independent musician in the Gold Coast or Brisbane region, do yourself a favour and go see the folks at Bignote Productions! 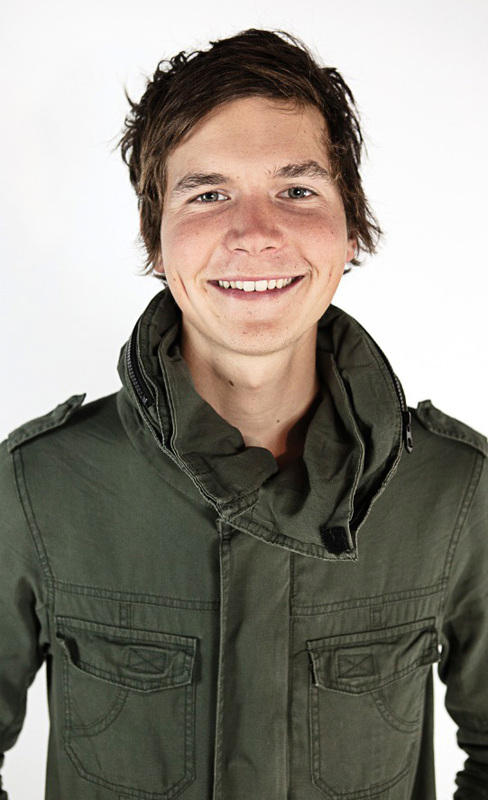 Gold Coast Videographer, Elijah Cavanagh asked me to shoot his portrait this week. 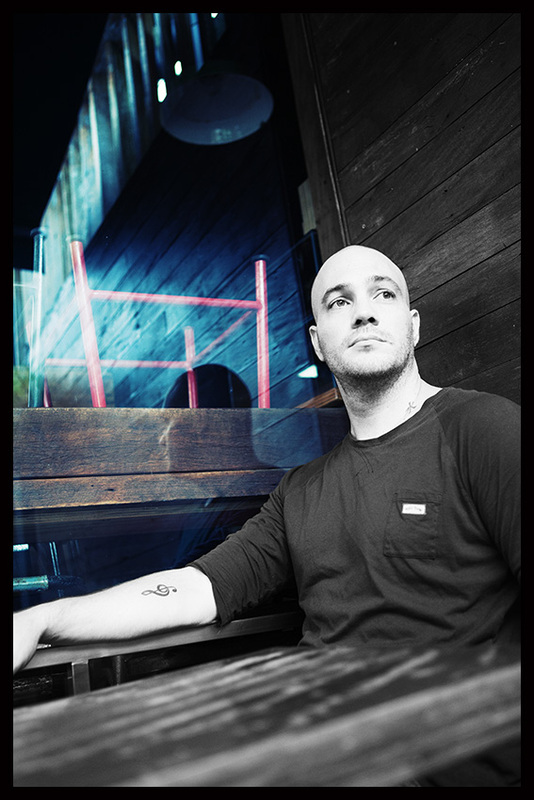 Elijah works here at the Burleigh Heads studio and this photo of him is as honest as the man himself. I shot with a very narrow depth of field to keep Eli’s eyes nice and sharp, with focus falling off quickly around his hair and jacket. Tidy. Elijah leaves us for a month today on assignment in Canada (shooting music videos – sweet gig)! You can check out Elijah’s excellent showreel here, if you’re interested in booking a fantastic Videographer for your next project, anywhere in Australia (or canada, evidently)! 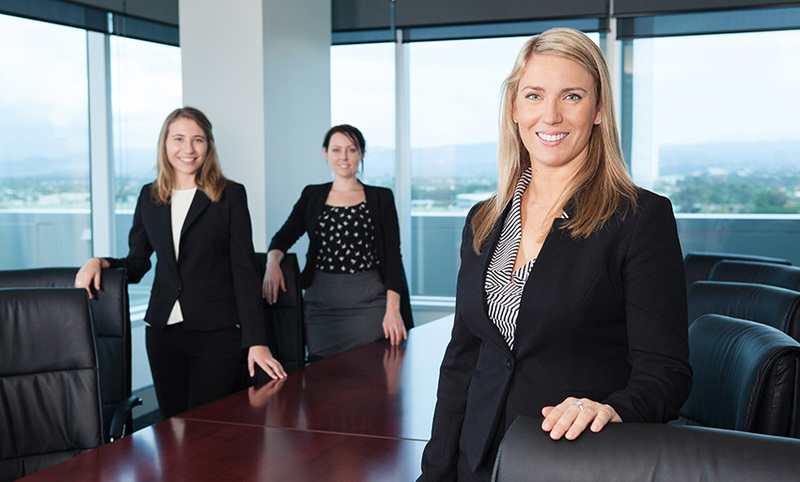 Last week I had the pleasure of photographing corporate portraits for my new client, Global Migration Consultants. The girls were a pleasure to shoot and wisely, wanted a different take on the generic ‘muslin background portrait’ that you would typically see for lawyers. We settled on a more approachable portrait that showcased both the friendly staff and the spacious boardroom that their downtown offices boast. Brochure samples arrived in the mail last week from my client, who I shot the below job for. I was shooting for a great Singapore design agency named DPI and their client was the Ministry of Social & Family Development. Shoot day threw me a few curve balls when the Art Director was unable to attend and I was asked to art direct the shoot myself (which is no problem – my comfort in doing exactly this, is why many of my clients hire me). The curve ball came when I was informed by their client that I wasn’t allowed to photograph the faces of the children who I had been sent there to shoot! The kids were all from troubled homes or were juvenile delinquents, so their anonymity was important for privacy reasons. I quickly decided that more abstract and ‘arty’ imagery would be needed to meet this brief, so I utilised the sunny day to backlight the kids and have their faces drop out to silhouette. Tight shots, low key shots, obstruction and shadow-play were also utilised during the two shoot days, to gather the body of work needed for the brochure. 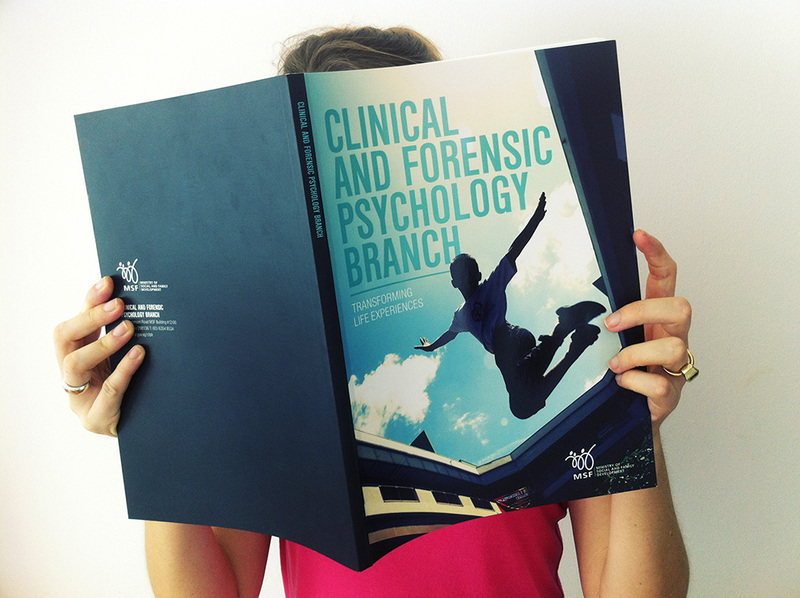 The client was extremely impressed with the solution to a tricky brief and the brochures look fantastic – props to DPI! 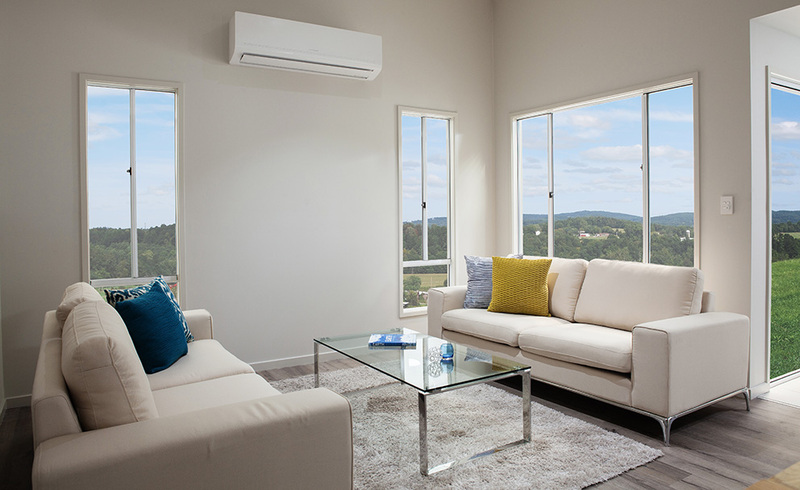 This week I photographed interiors for ABC Construction – a client in Yatala, south of Brisbane. ABC produce steel kit homes and have an old school business model which, somewhat wonderfully, involves excluding banksters from any of their dealings, in order to reduce liability all round. I shot both interiors and exteriors for them, photographing the entire show home. Because the home was still in their enormous warehouse awaiting delivery , I also retouched the warehouse view through each window, with rural property views using Photoshop. Both the photo shoot and image retouching turned out really well, the client was impressed and I got to hit the famous Yatala Pie Shop on the way home, so everybody was happy! A while back I was flown to Beijing to shoot for Scoot Airlines. 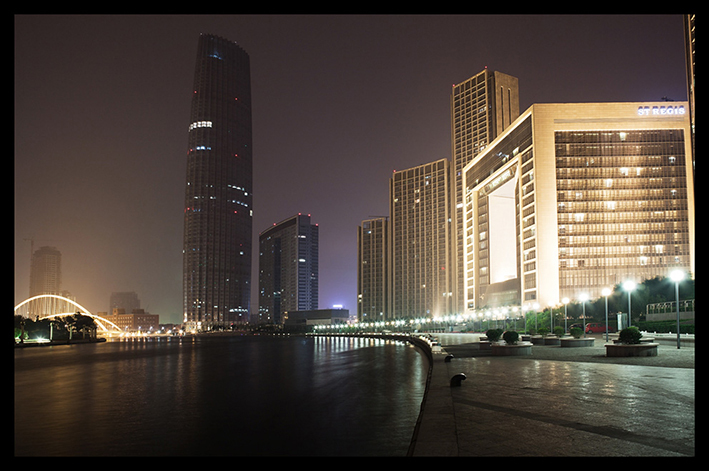 I was to cover the city of Tianjin, an hour or so on the bullet train from Beijing. 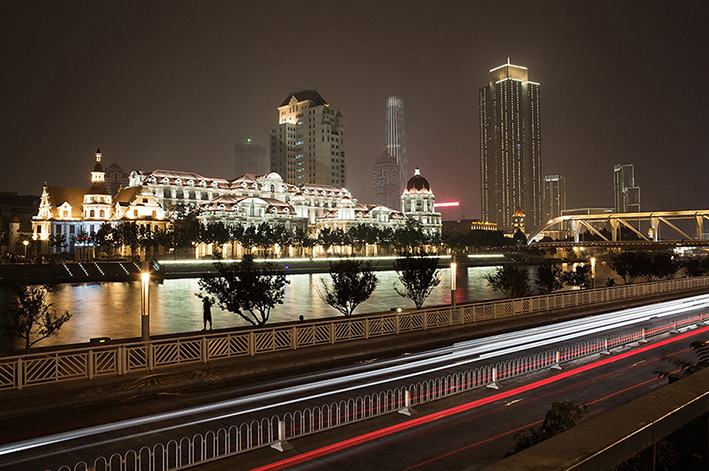 This is my ideal gig – wandering a foreign land with a very open brief and a camera in hand. This very thing is what took my photography from ‘hobby’ to ‘obsession’ so many years ago and these kind of shoots for me, ironically, feel like coming home. I had an amazing time shooting the city – sitting regularly as inspiration took hold, to write the feature article passages that would accompany my photography. The piece was well-received in the in-flight magazine and once again, I counted myself very lucky as having had another international shoot of this kind. 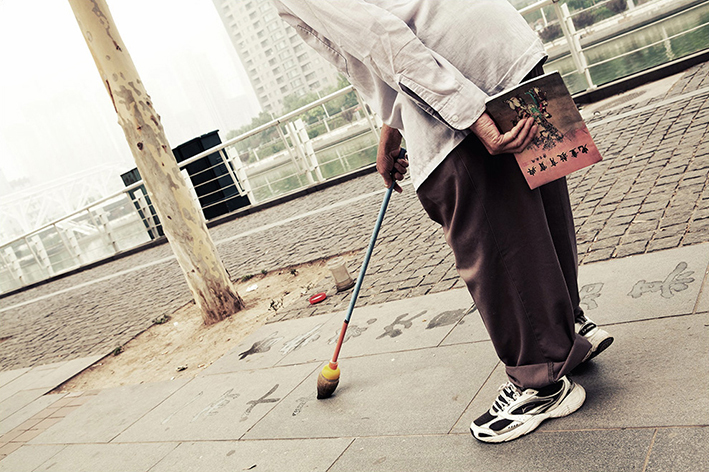 Old local practising Chinese character calligraphy with water on the dusty morning pavement. 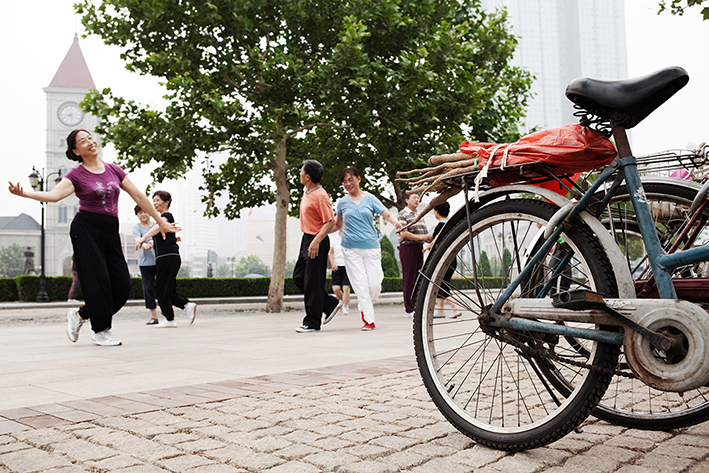 A friendly social dance group in a Tianjin City park. 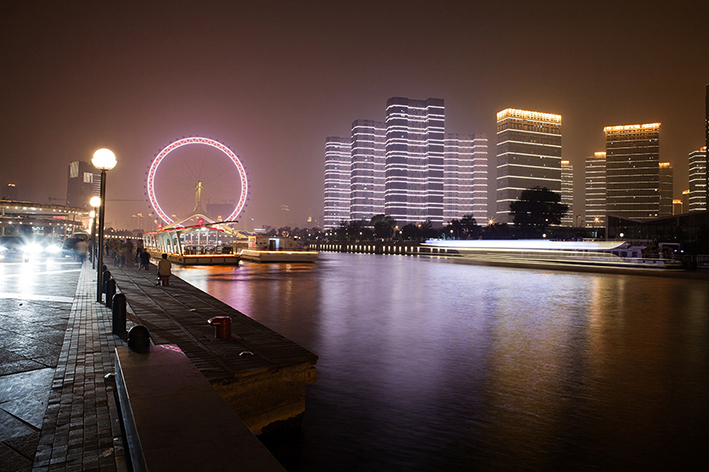 The serene Tianjin River by night. 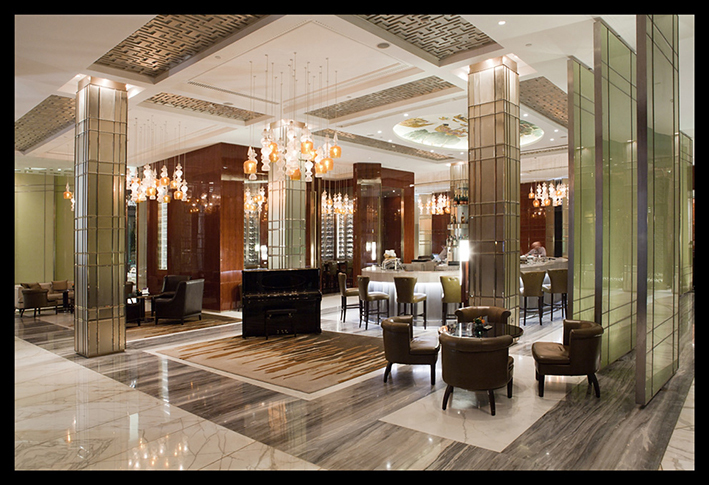 During my stay, I was put-up at the stunning St Regis Hotel, which was a most welcome sanctuary after some very long days wandering the many landmarks and quaint hutongs. Upgrading me to one of their finest suites after some friendly chat, I felt it only right to return the favour by snapping a few interiors of the hotel for their marketing. 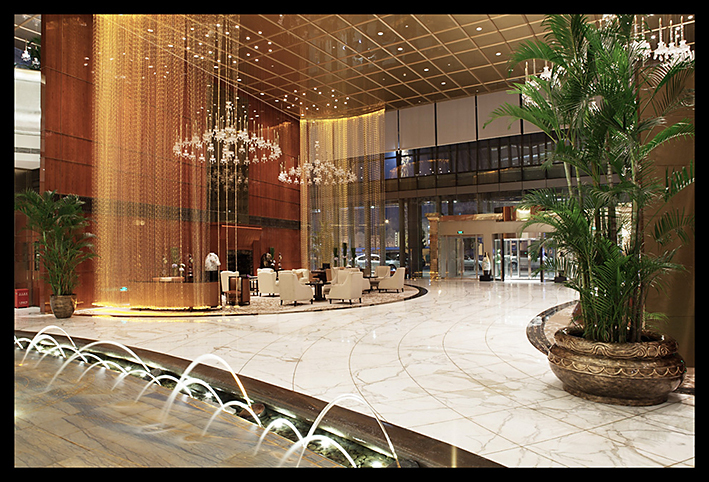 Appreciating such beautiful interior design is again, one of my favorite aspects of what I do. Before I left for Tianjin, a client at Fitch Design in Singapore heard that I was headed to Beijing briefly, so booked me to shoot for Dell computers while I was in town. Our team was wined and dined after each day at some of the cities best restaurants and I tacked a couple of days onto the end of the trip to visit the Great Wall and of course the Forbidden City. 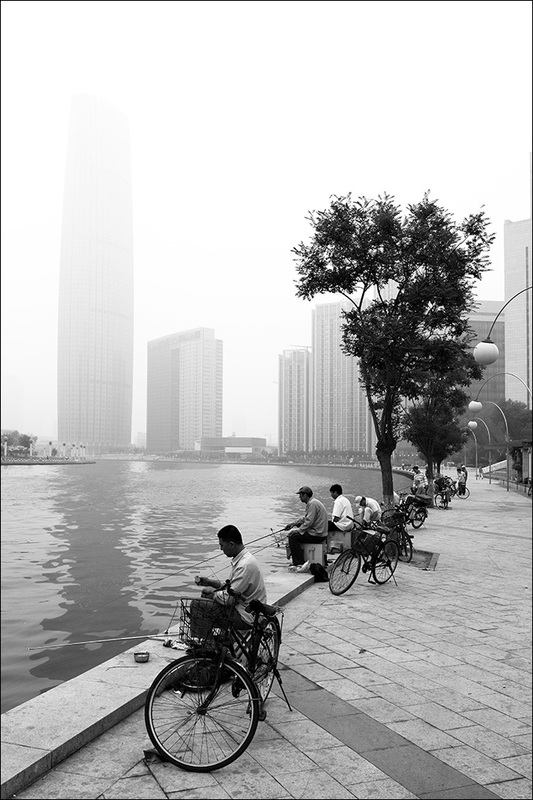 The trip was over all too quickly, though a taster of China in this way was, as a Photographer, as good as it gets! 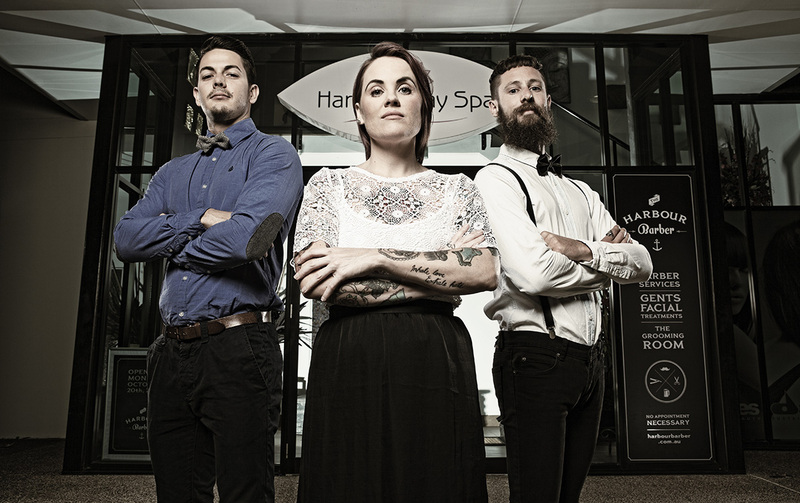 Last week I had the pleasure of art directing and shooting for a business that I truly believe in for social reasons. This is a rare treat and I was so pleased to see how ecstatic the clients were with the photography. 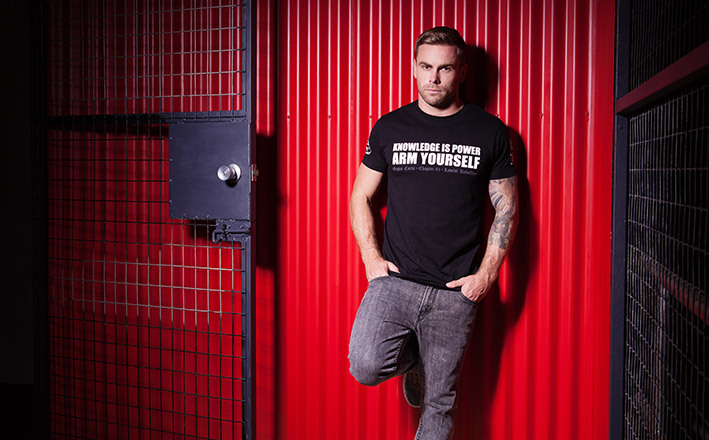 Lawful Rebellion is a business based on the Gold Coast, Australia, who have launched a clothing range featuring socially-conscious messages. Their mission is to encourage self-education regarding civil liberties and the self-empowerment that’s gained through shared knowledge. in this era of rapidly eroding civil liberties (particularly in Australia) and I’m very happy to throw my support behind initiatives that aim to bring about positive change. I’m extremely excited to launch my new site today, which is a vast improvement on the previous one – a task that escaped me for too long! This site was built by David Hackett at nomadicmultimedia.com, who I can’t recommend highly enough. His work was thorough, prompt and he was extremely helpful in teaching me the back-end management side of things. Thanks Dave! Please feel free to check in regularly to see what I have been shooting or click on the RSS feed button on the far right of this page. I will be riffing here from time to time about various projects of note as well as relevant industry thoughts and news. Please also feel free to follow me on Twitter, or connect on LinkedIn if we’ve already done business together. Take care – until the next!